Yesterday I published a look at travel statistics for 2014 – just shy of 115,000 miles flown on 61 flights, both of which were new records. Here I am going to review the year’s travel chronologically… in pictures. Lest anyone get the wrong idea, I must note that most of the time on business trips is spent in non-photogenic (i.e. ugly!) conference or hotel rooms…but I’m picking out the highlights here from special events or any extra time after the work was done! Although we started the year in Dubrovnik, I was soon off to Washington DC for my annual trip to a massive transportation conference (in 2014 there were more than 12,000 people attending!). Unlike in past years, where I added on extra time to see family or for other work on the East Coast, 2014 was a quick turnaround. 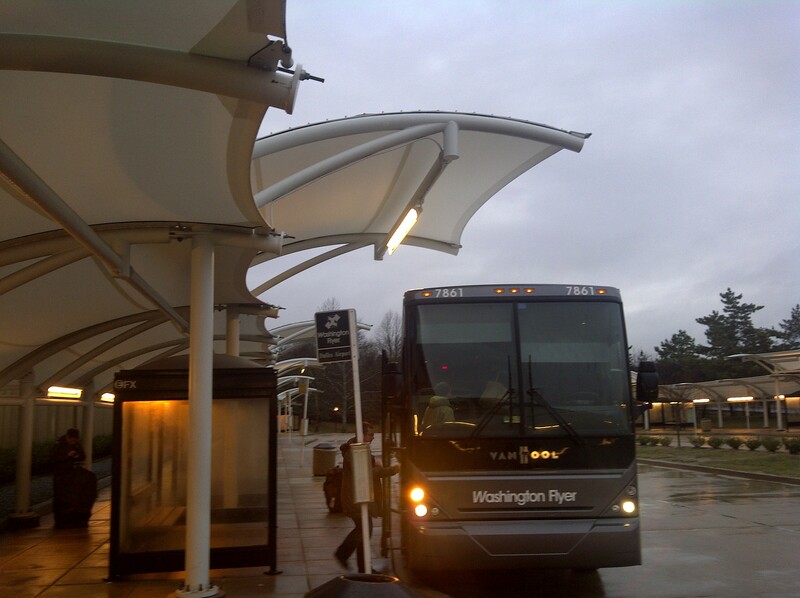 For the last time, I took the Washington Flyer bus from Dulles Airport to the West Falls Church Metro Station. Later in 2014 the new Silver Line opened a good part of the way to Dulles, so next weekend I’ll be taking the new shorter, cheaper and more frequent shuttle bus to the new metro station! 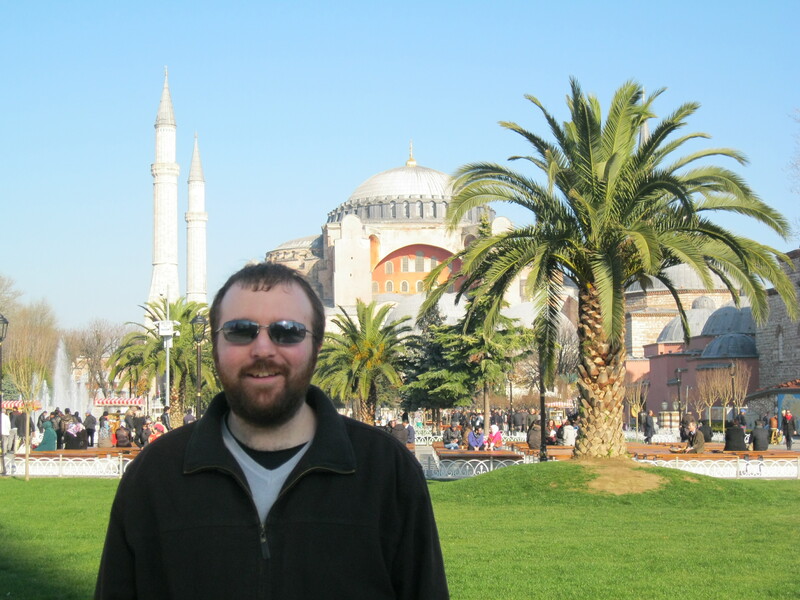 In February, I spent a week in Istanbul for work, returning a little more than a year after our Christmas 2013 trip. Astrid went to Istanbul later in the year with our friend Sarah. 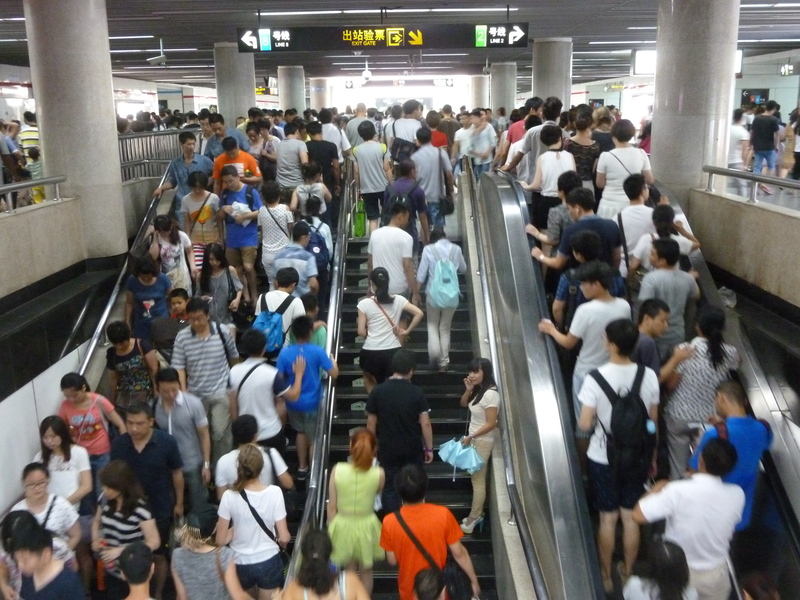 While I spent more time riding the trains, I believe they spent more time shopping in the bazaar. 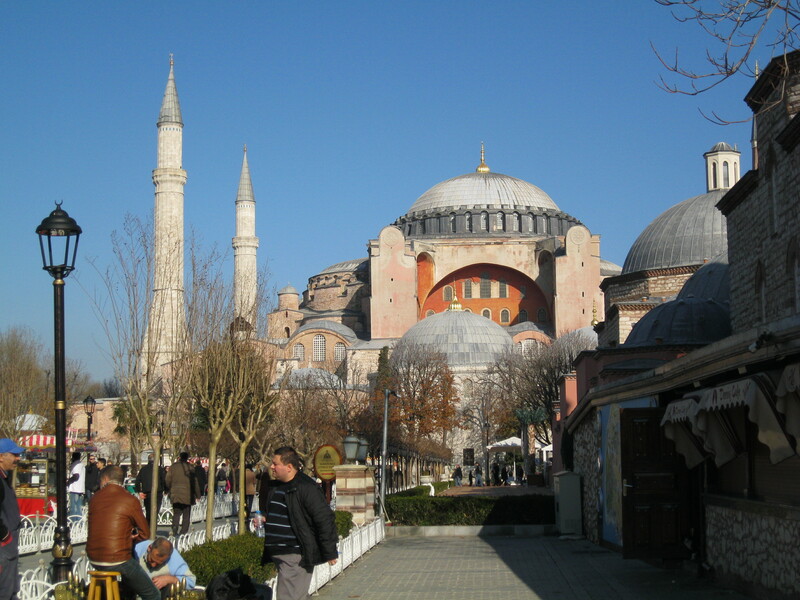 There are things for both of us to like in Istanbul, that is for sure! 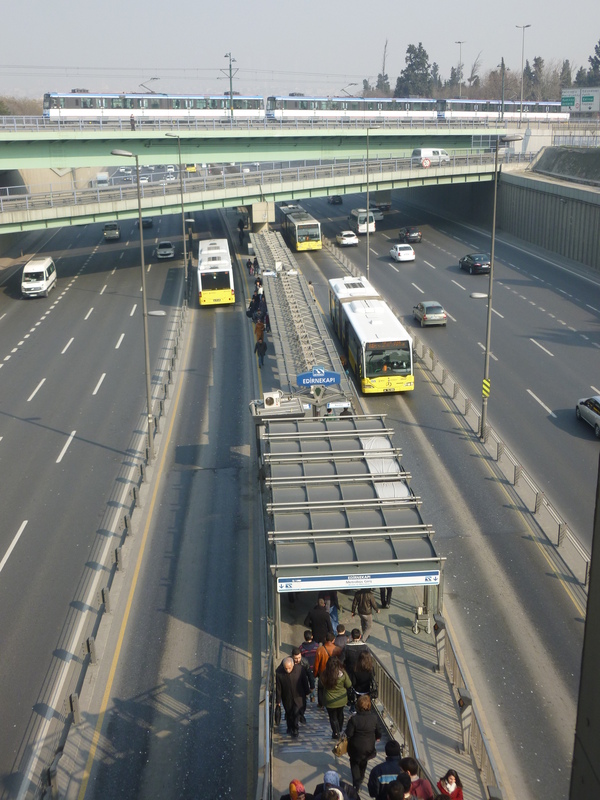 Istanbul has developed a very diverse transit infrastructure in recent years, with a lot more to come – this is the absolutely astonishing Metrobus, which is a 31-mile line in the median of a very busy expressway (sort of like Istanbul’s beltway). The line carries nearly 1 million passengers per day with buses every 14 seconds during rush hour (and about every 20 seconds the rest of the day!). This is the Edirnekapi station, which is near a station on the T4 light-rail line, which can be seen crossing above. 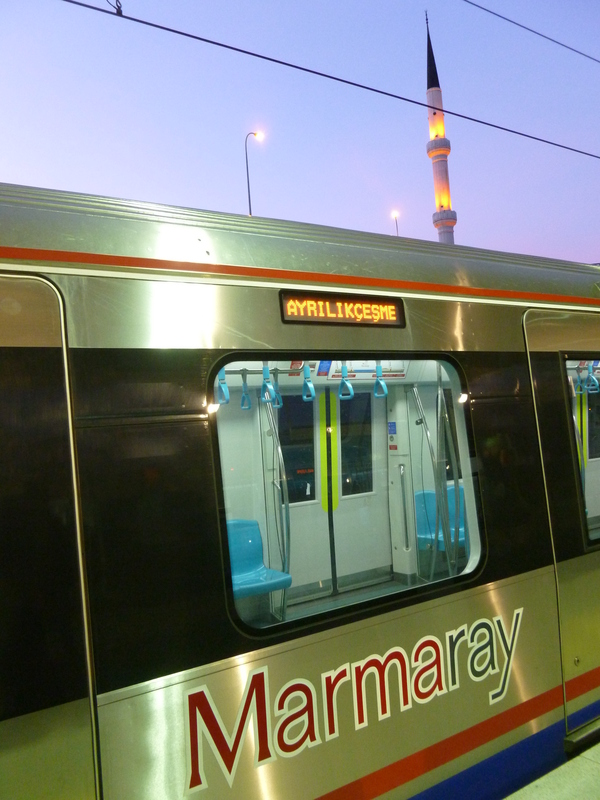 I also got to ride the new Marmaray train under the Bosphorus, linking the European and Asian sides of the city by rail for the first time. The Metrobus goes across the bridge, and ferries have long and frequently made the 30-min trip, but the train takes only about 5 min. This is the temporary terminal on the Asian side, which connects with the metro (Line M4). This line has one of the highest potential capacities of any in the world at more than 90,000 PPHPD (passenger per hour per direction). 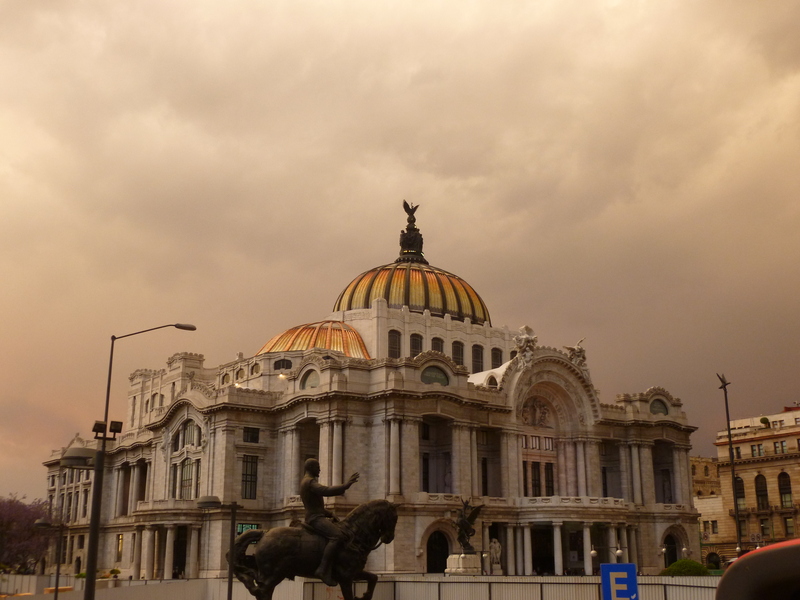 March was my first time in Mexico, with a week-long trip to Mexico City. It was interesting – amazing hospitality from our local hosts, including caring for my boss when he got sick during the week (and I had to take over everything! ), great food, and interesting challenges for the metro – but also the feeling of being in an armed bubble, with a big security force surrounding us at all times (even surrounding our bus in pick-up trucks – no doubt also a type of hospitality, but not one that made me feel at ease). 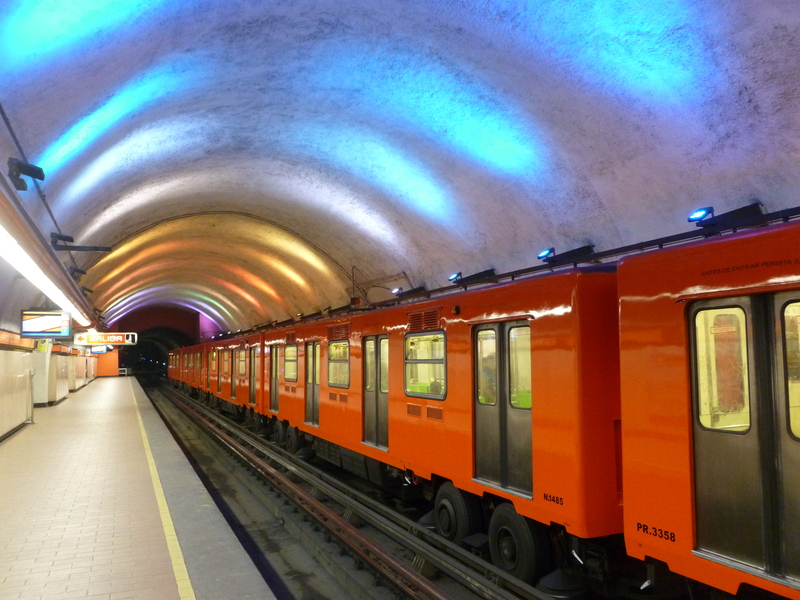 The Mexico City Metro is one of the busiest in the world, and is different from many other metros in that it caters to the poorest people in the city…it is actually cheaper than buses (whereas in many other cities, especially in Latin America, the metro is the more premium mode for middle-class people and buses are for the poor). Because of this, and the very many people coming into the city (DF) from the surrounding State of Mexico, it is very busy. This is the beautiful Art Deco Palacio de Bellas Artes, where our group had a private tour and a nice dinner. 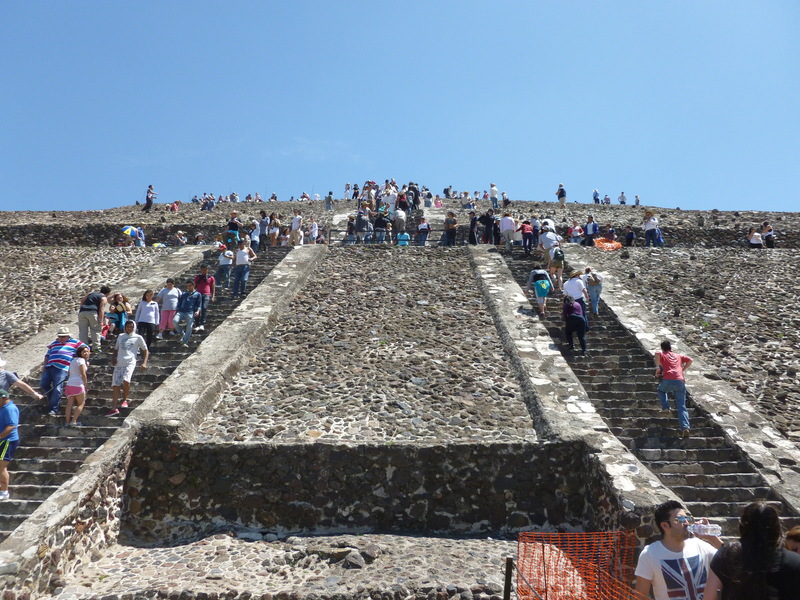 On the Saturday our group was taken to Teotihuacan, the site of the famous pyramids less than an hour north of Mexico City. 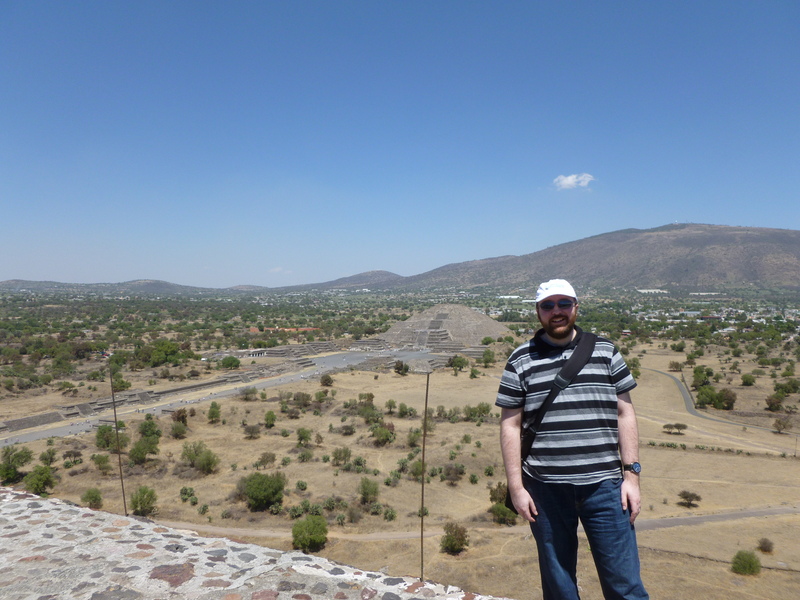 Here I am at the top of the Pyramid of the Sun after a climb of more than 200 feet in the hot sun. Behind me is the shorter Pyramid of the Moon. This was the climb I made to reach the vantage point in the picture above…pretty steep! At the start of April, a colleague and I made a trip through the Midwest of the US, visiting Dayton, Cleveland, suburban Chicago and Des Moines. 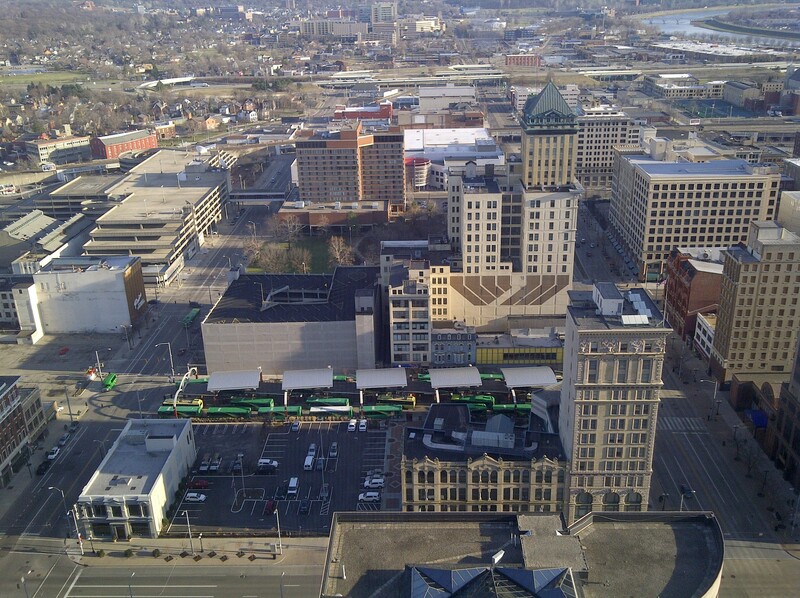 This is downtown Dayton, Ohio – looking out over Wright Stop Plaza, the downtown transit center, from the top of a tall building. See the green buses? This is the evening line-up, when buses from most routes all come together at once to allow transfers and then depart (a moment after this they start to pull out like a long green snake!). This particular transit center is special because it has trolley wire and serves trolley buses…despite being a smaller city and transit system Dayton is one of only five US cities to have any trolley buses remaining. 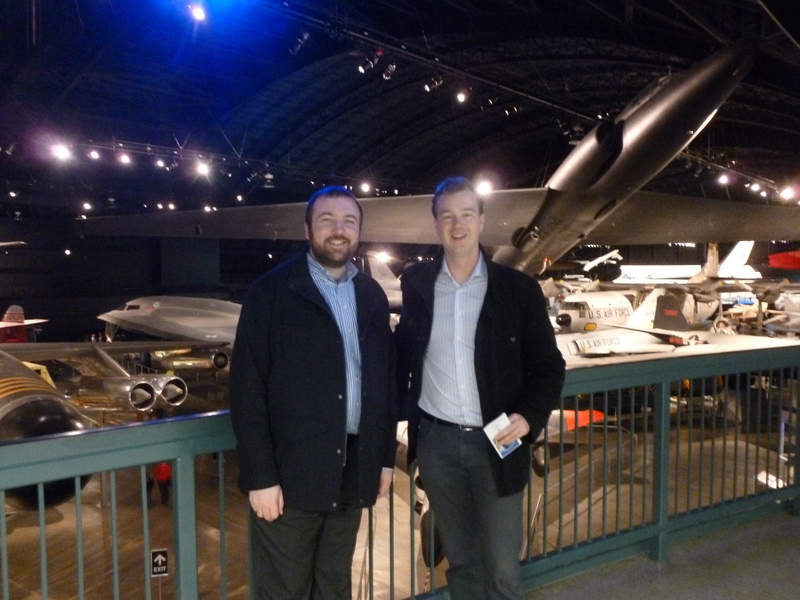 While in Dayton we also got to visit the US Air Force Museum at Wright-Patterson Air Force Base, which was just massive with a very impressive range of planes on display. 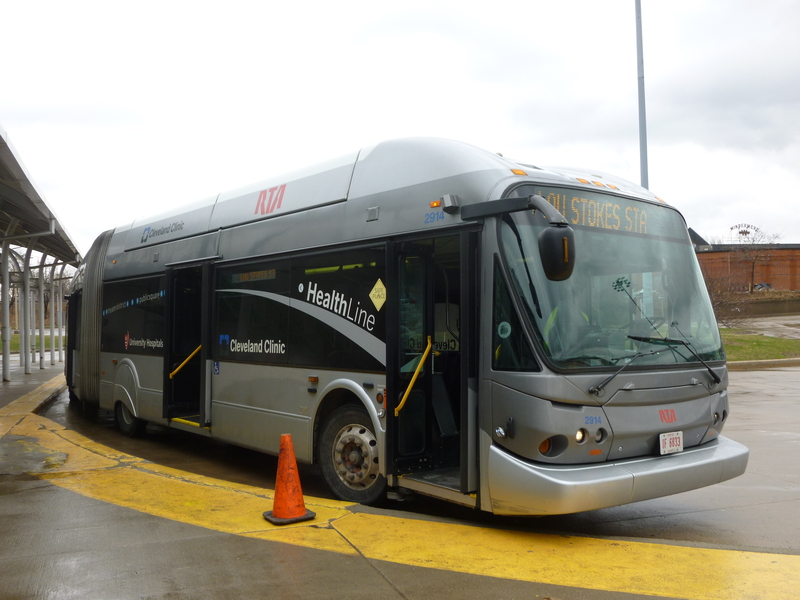 In Cleveland we had to check out the HealthLine, Cleveland’s BRT (Bus Rapid Transit) route…the many hospitals along the route (including the famous Cleveland Clinic) paid to “sponsor” the route. It is one of the only BRT lines in the US considered to be true BRT (but only to a ‘bronze’ level worldwide, not ‘gold’). It operates 24/7, every 30 min overnight, every 7.5 min all day weekdays, and every 15 min evenings and weekends. Here the special BRT vehicles (which have doors on both sides for island platform stations) is at the eastern end of the line, Louis Stokes/Windermere Station on Cleveland’s heavy rail Red Line. Speaking of the Cleveland Red Line, here is the far other end of the 19-mile, 18-station route – at Cleveland Hopkins International Airport. We used the train both ways between the airport and downtown…it runs about 4am-1am 7 days a week, every 15 min all the time except every 7.5 min during rush hours between the airport and downtown and every 30 min after 9pm. This was the first airport-rail connection in the United States when it opened in 1968 (airport rail links were the topic of my master’s thesis!). Although business was in suburban Chicago, we had a weekend day to spend in Chicago. 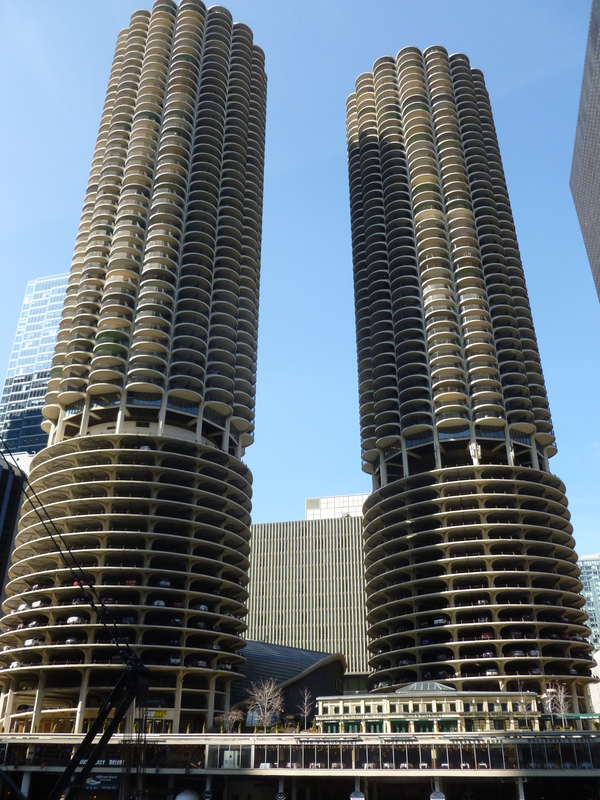 We managed to find a hotel in the booming River North area, just outside the loop and with a view of Marina City. The design of this mixed-use complex adjacent to the Chicago River has always attracted my eye for the bold modernist design – it was designed in the late 50s and finished in 1964. The two identical 65-story towers each have 19 floors of parking and then apartments (now condos) that are comprised of pie-shaped wedges – see Wikipedia for more info. We made quick work of the key Chicago attractions – seeing the loop elevated trains, deep-dish pizza, and the Sears Tower – reminding me of my first visit to Chicago, probably the first truly big and great city I ever visited when I was just maybe 7 or 8. 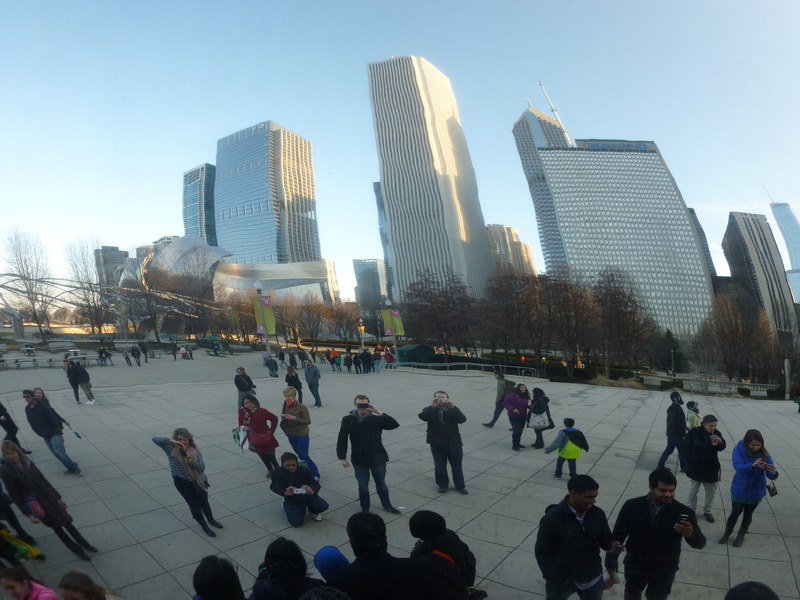 But what Chicago visit nowadays would be complete without visiting Cloud Gate, aka The Bean? This is the reflection in the bean – can you see the photographer? You can also see in the center the very sleek Edward Stone 1972 tower with similar styling (if not materials) to the original World Trade Center New York , originally the Standard Oil Building and still the 7th tallest in the US. The last stop on the Midwest Tour was Des Moines. Not much to report from “flyover country”, although to be fair it was a decent place that exceeded my expectations. I thought I had a picture of a sign that said “Des Moines – not as bad as you think” but I can’t find it! 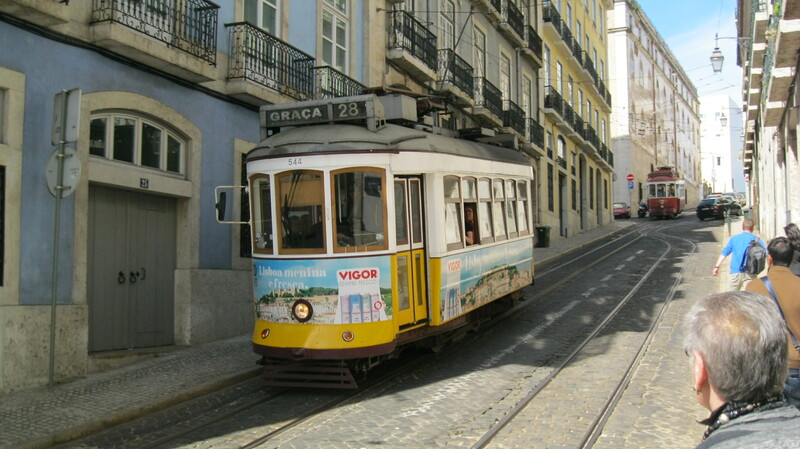 What better to encapsulate our excellent long weekend in Lisbon in April than a tram? Astrid and I both were enamored with the colorful and dynamic city by the water…for more, see the many posts we made about Lisbon, including the roofs, the street scenes, the river, and our general overview. May took me to Toronto, one of my favorite cities in North America – going all the way back to my first visit with my parents in 1993. Although others laugh, to me Toronto is a cleaner, nicer, gentler version of New York…it is one of the most diverse cities in the world, actually. 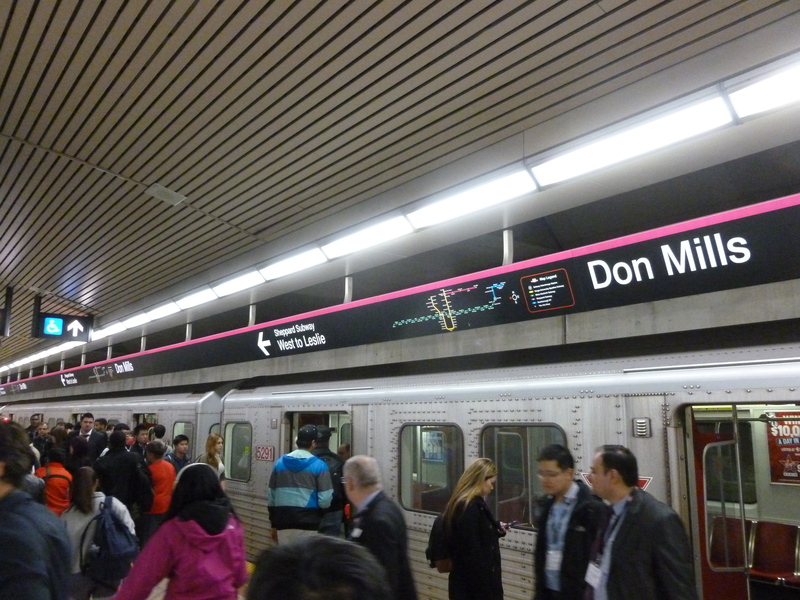 Even though its subway is quite small compared to New York, it is similar in style and dense, except for this picture – which is the Sheppard Line, an outer stub that opened in 2002. One of the best features of the transit system in Toronto is the excellent intermodal connectivity between the subway, streetcars, and buses. We had a great reception at the Hockey Hall of Fame and then dinner at the top of the CN Tower, the long-time tallest freestanding tower in the world (not eclipsed by the Burj in Dubai), but it was so foggy that the pictures didn’t turn out too well. 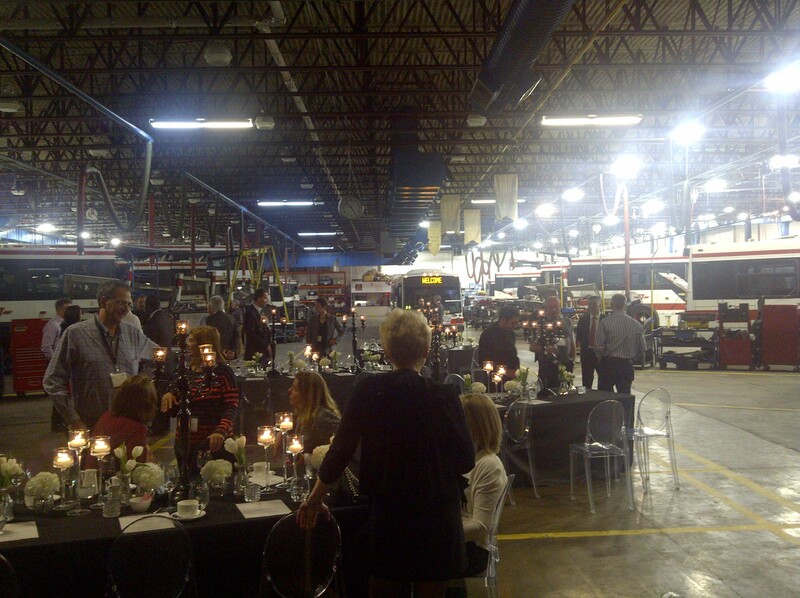 Have you ever had a formal dinner in a bus maintenance workshop? I have to say it was quite unique and better than you would imagine thanks to the imagination and hard work of the hosts! In between work in Toronto and Rochester/Buffalo, I had a nice weekend stop in Niagara. 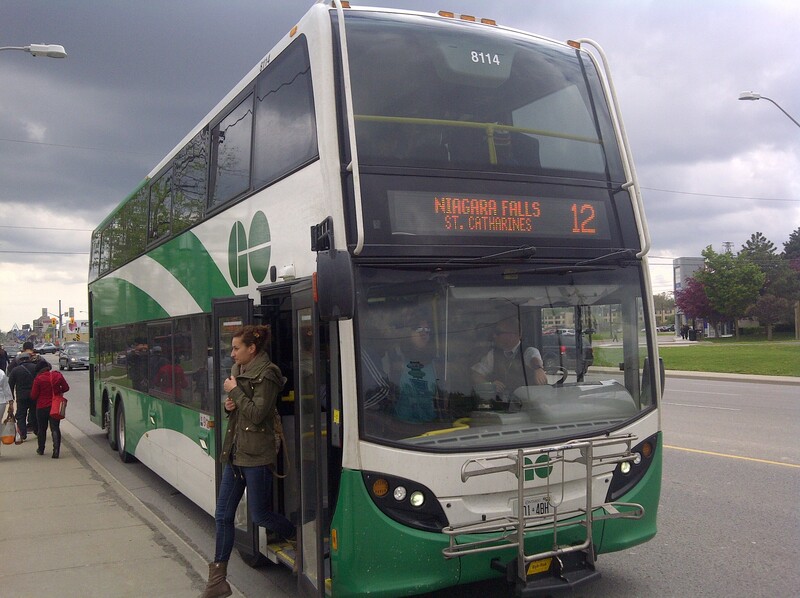 We even managed to get there by GO train and bus – excellent double-deckers in use in Ontario, and despite the lower density outside of the city of Toronto there is healthy transit service and usage…as usual, Canada providing a model for its US neighbors! 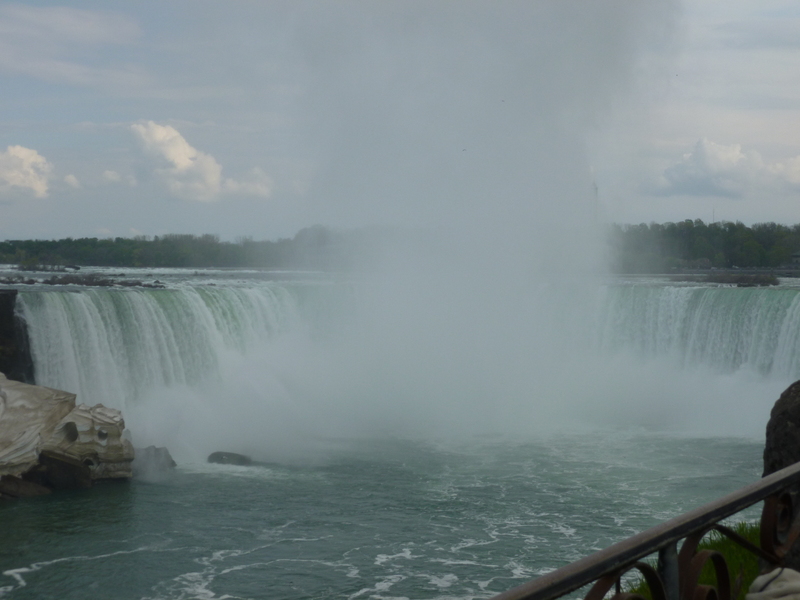 Although it is gimmicky, I have always loved Niagara (Ontario, not NY!). After this, a colleague and I crossed the border on foot (the first time I’ve done that in the US-bound direction) and tried to get a bus from Niagara into Buffalo. Sadly, we waited on the wrong side of the street for the hourly bus – even transit professionals can’t figure it out with very limited and poor signage – and had to get a taxi (gasp!) to the Niagara Falls Amtrak stop (calling it a station would give it too much dignity). After the work part was done, I had essentially three days on my own before meeting Astrid in Los Angeles for the family part of this massive May trip. As you can imagine, I agonized over how to spend this precious time. Visiting friends in the US was basically ruled out due to working weekday, and from a starting point of Buffalo I had to end up on the fourth day in LA. I seriously considered a visit to the Canadian Club factory in Windsor, Ontario followed by a dark tourism stop in Detroit, but I figured that wouldn’t work so well by transit and with lots of luggage. 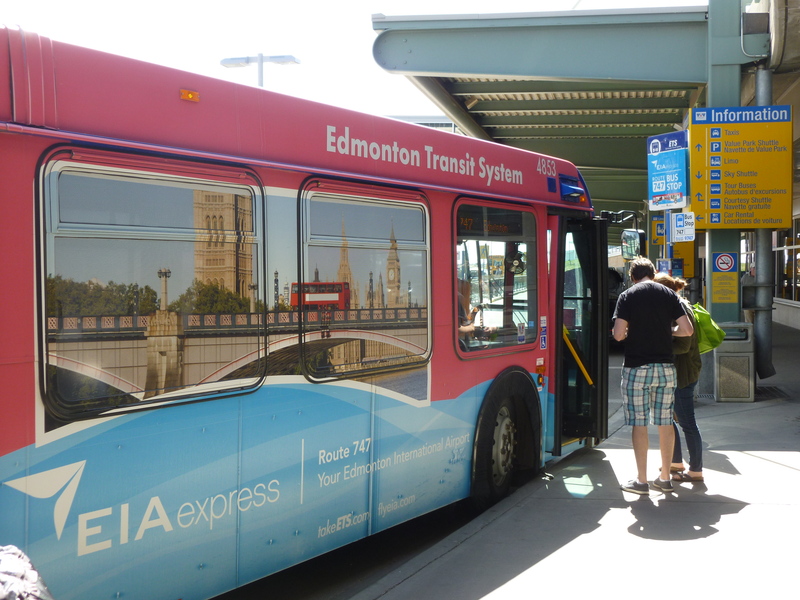 Instead, I chose to visit Calgary and Edmonton, two Canadian cities (and two excellent modern light rail systems) that I had always wanted to see. This required a complicated travel plan, especially since air travel to and within Canada is generally pretty expensive (with the airport in Toronto, for example, having some of the highest taxes/fees of any in the world). I devised a cunning plan, combining the purchase of cheap segments with an available first-class miles redemption from Dallas to Calgary (for the expensive cross-border part). Now, you are probably thinking that Dallas is slightly off any sensible route from Buffalo to Calgary…but such is life in “air world”. It started brilliantly; a hard but rewarding day’s work in Buffalo, with an early arrival and easy check-in at the airport, and settling down in the US Airways Club with a nice glass of wine. 30 seconds later, the iPad revealed that my flight to Dallas that night was cancelled! Instead of a relaxing night in the Hyatt Regency DFW and an easy 10am start the next morning, I had a ‘free’ night at the crappy Days Inn Buffalo Airport and a 4:30am wake-up for a 6am flight to Chicago, to then connect to Dallas all in time for my scheduled 10:55 flight to Calgary. I was actually hoping that my extensive luggage wouldn’t make it through both tight connections (so they would have to deliver it to me in Calgary instead of me carrying it! ), but it did. Some tense moments and a little running at DFW got me to the Calgary flight just in time…and the plan was back on track. Until Canadian border officials in Calgary didn’t like my reason for being there – “just to visit the city” – and decided to give me an extra private interrogation and a VERY thorough check of all my bags. I thought Canadians were all supposed to be friendly? Again, I know that a lot of people get treated like this all the time, so I shouldn’t complain – but after a 4:30am start and the hassle of the day, I wasn’t in the mood. After that, I have to say, Calgary and Edmonton were nice cities. 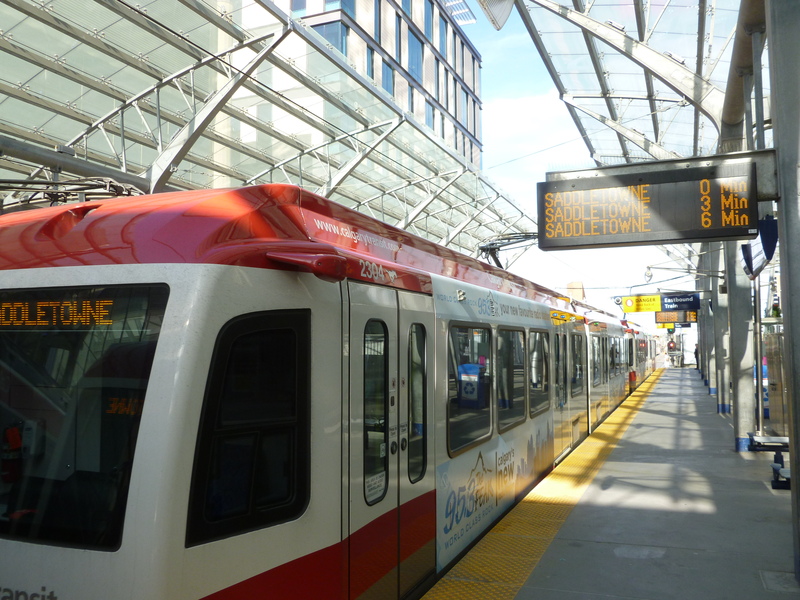 The Calgary C-Train is one of the best light rail systems in North America, with higher ridership than all of the US ones. It started running in 1981 and has been expanding incrementally since then. It covers about 36 miles and has 45 stations, with two routes that overlap in the downtown core. They key is frequency; each route operates every 10 minutes virtually all of the time (7 days a week) and every 4-5 minutes during rush hours, leading to a very busy downtown core (as shown above) with trains every 2-3 min. Again, as with Toronto, Calgary sets the model for its American cousins to the south – that an North American city with lower density and high car ownership can have good transit that is well used by all. I then ventured even further north to Edmonton, in the comfort of a Greyhound (Canada) Express service. Who can argue with $25? 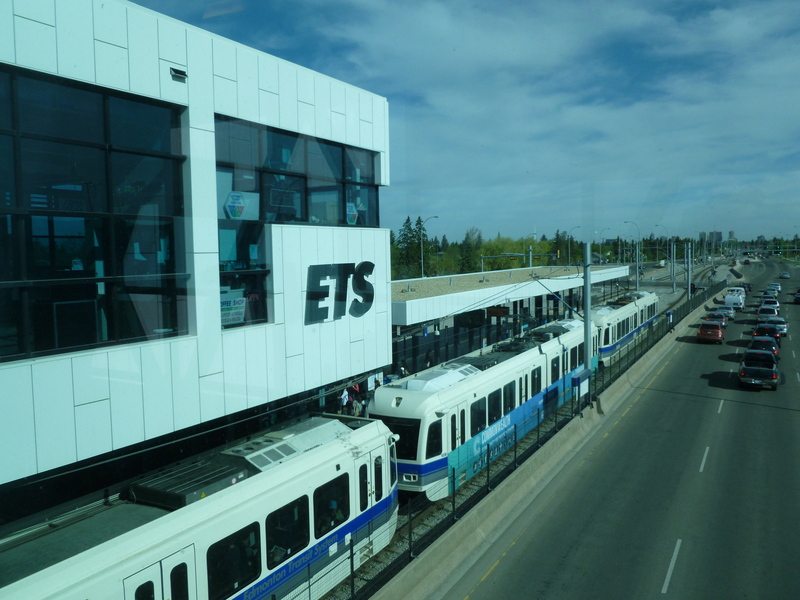 The Edmonton Transit System light rail line was the first modern one in North America, starting the trend that the San Diego Trolley brought to the US in 1981 and that has exploded primarily in the South and West of the US in the past 30 years. It is still small – a single 13-mile line with 15 stations – but is dense, carrying about the same number of riders as the San Diego Trolley that is 4x as big. Again, the key is frequency; every 5 min during rush hours, every 10 min all day weekdays and Saturdays, and every 15 min evenings and Sundays. It is really more of a light metro line, with four-unit trains in operation and the downtown section with 6 stations being underground. This picture is the Southgate Station, which opened in 2010 adjacent to a mall…even though it is in the middle of a large road it has good facilities with a transit center with bus connections and parking. I used the ETS Route 747 to connect from the end of the light rail line at Century Park Station to the airport, which is quite a distance south of the city. The non-stop bus trip was about 25 min for $5, and had a luggage rack. But despite having a very nice transit center at Century Park the stop for the bus was on the main road and not signed at all – a disgrace! Note the advertising for London on the bus 🙂 Despite that, my next stop would be Los Angeles via Vancouver on WestJet. After more than a week visiting families in Los Angeles and Baltimore (where we proudly watched my little brother graduate from High School), we made a quick stop in New Jersey to visit our storage unit, pack up a few things, and then head home. After getting back home from the mega-trip, we headed right back out for a quick weekend in Manchester. We had scheduled this long before the May madness was arranged based on a great deal – the ability to add a domestic flight within the UK onto either (or both) ends of any European award flight redemption on British Airways for free. So, despite living a 5-minute walk from Euston Station, which has express trains every 20 minutes to Manchester that take about 2 hours, we actually flew from Heathrow as an add-on to our flight back from Lisbon (there can be up to a year stop-over in between, as I understand it – it just requires you knowing what you want in advance, because changes cost about $50 each). The Manchester weekend was relaxing – it is definitely the most dynamic city in the UK after London, with a good vibe and a great new light rail system (Metrolink). 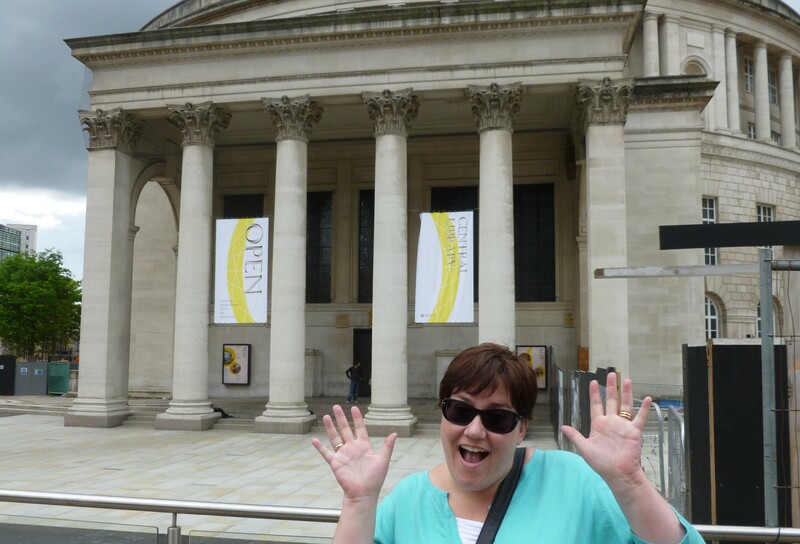 Here is Astrid with the historic Roman style Manchester Central Library in the background. 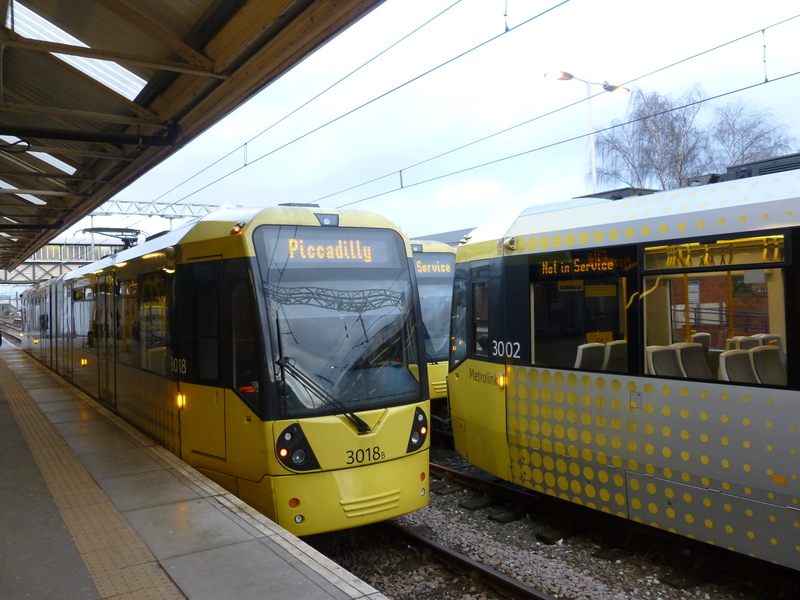 This is Manchester Metrolink – it started in 1992 and has grown significantly in the last couple of years, to a total of 57 miles and 92 stations with 7 different services that each typically operate every 12 min (with some overlapping). This photo is at Altrincham, the southern terminal of the original line, which was converted from a railway line. 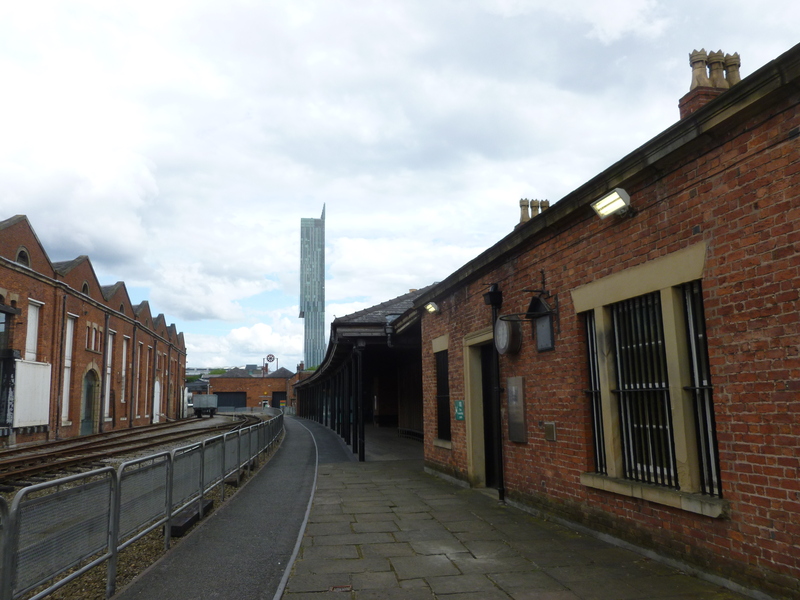 In Manchester we visited the Museum of Science and Industry, which has on its grounds something unassuming but quite remarkable – the world’s first railway station. This was Liverpool Road Station, the Manchester end of the world’s first railway to be entirely by steam power – the Liverpool and Manchester Railway. Now, being from Baltimore I was initially skeptical, as I had believed that the Baltimore and Ohio (B&O) Railroad was the world’s first – but it seems from Wikipedia that both started operations in 1830, but the British one had all steam (no horses) first. Interestingly, this first station became overmatched so quickly by the success of the railway that it was closed in 1844! Later in June I was very happy to be able to return to Malaysia and Singapore. Despite the extreme heat I really liked both places on my first visit in 2013, and it was great to confirm those first impressions in 2014. 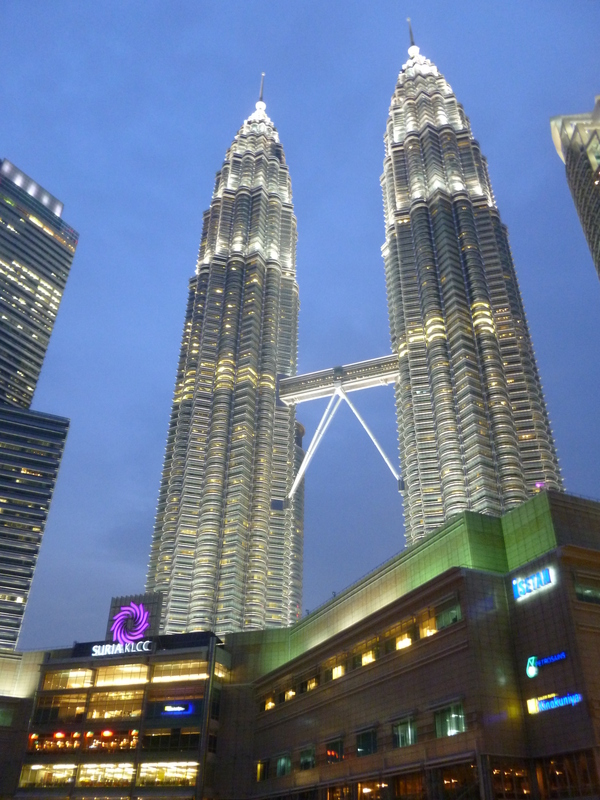 Here are one of the symbols of KL, the Petronas Towers, with a nice evening view. I went to the top (and across the 42nd-story skybridge!) in 2013. Designed by Cesar Pelli and finished in 1998, these took over the “Tallest Building in the World” title in 1998 from the Sears Tower (which had reigned for 25 years). However, with the incredible wave of skyscraper construction in the China Region, Petronas only lasted 6 years at the top, when Taipei 101 took over, and now they are only number 9. See more info from Wikipedia. 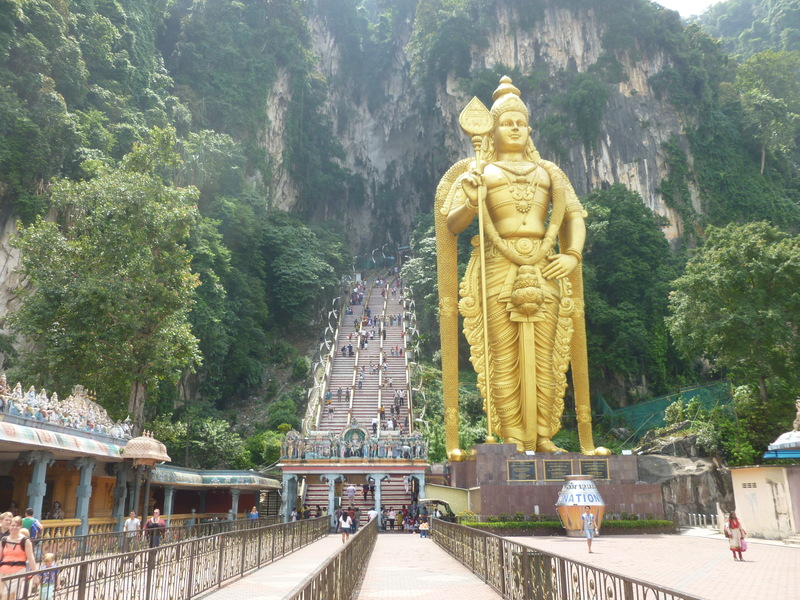 From my post “Speaking of Monkeys“, here is the entrance to Batu Caves on the outskirts of Kuala Lumpur. My home for the nearly 8-hour train journey from Singapore to Kuala Lumpur. The distance is about 220 miles, or very similar to Washington-New York, with very frequent flights that take about an hour. But I wanted to see the countryside! Unfortunately, despite “splurging” for first class, the train was pretty tired and my window had some sort of glazing issue such that I couldn’t really see out. There are plans for a new high-speed rail link between the two large cities, which may finally happen. 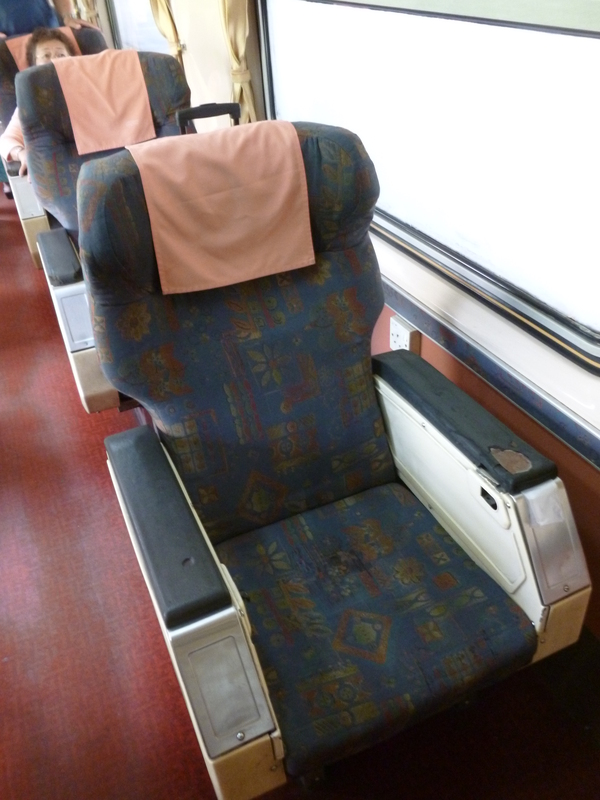 I used the fantastic Seat 61 website for information about traveling by train around the world. 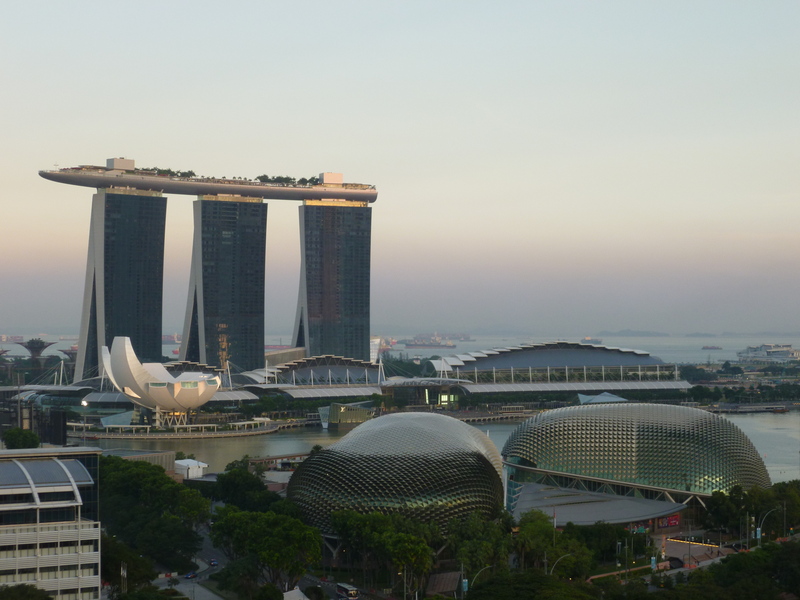 The view out my hotel window showing the ridiculous-yet-mesmerizing Marina Bay Sands hotel and casino, with the two pods of the Esplanade Theatre on the Bay in the foreground. My hotel, the Fairmont Hotel Singapore, was probably the nicest hotel I have ever stayed in, with the best hotel breakfast ever! 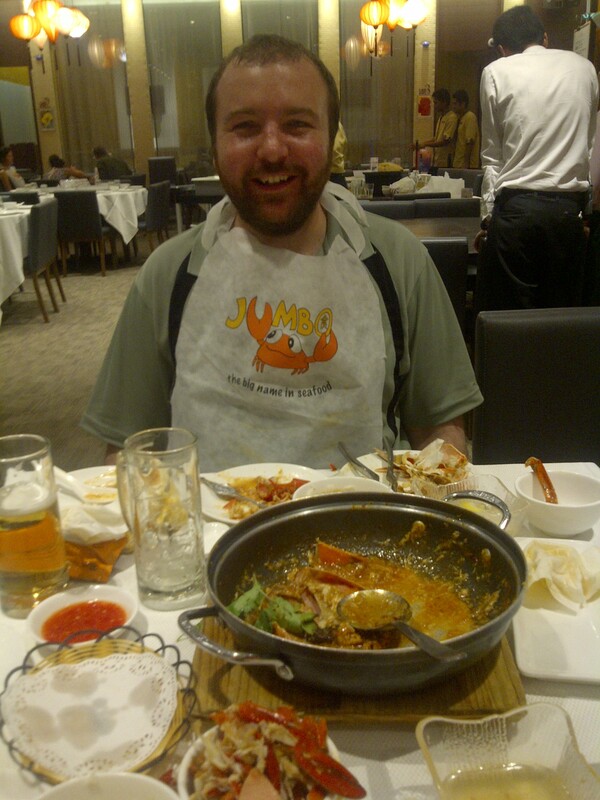 They say that you can’t really experience Singapore without trying chilli crab, which I missed on my first trip – so here I am at the end of the messy feast at Jumbo along the Singapore River. We didn’t really do much in July. After a break, it was on the road again to China in August, with the first stop being a week in Shanghai. Although I was there in 2010 on one of my first work trips, so much has changed in Shanghai in that short time, including the continued massive growth of the metro into the world’s largest. 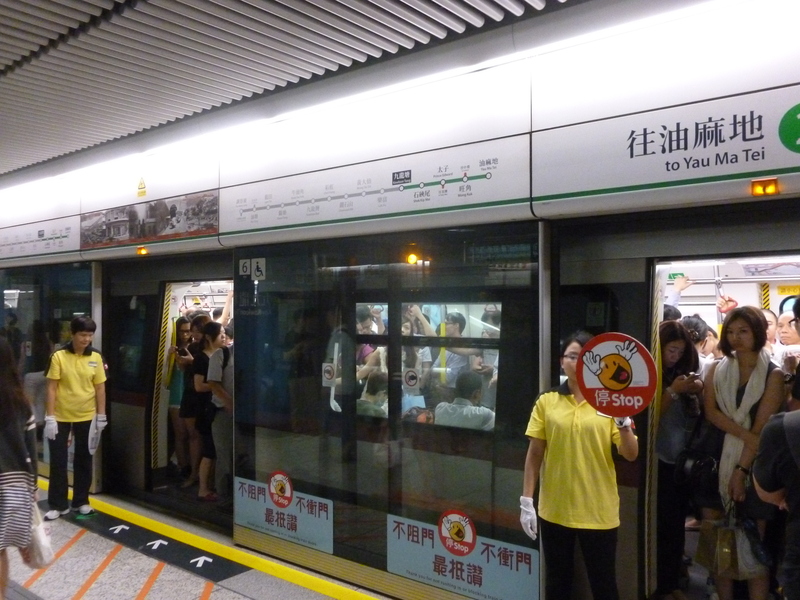 Since late 2013 Shanghai Metro is now the largest dedicated metro network in the world, covering more than 340 miles (compared to New York’s 232 or London Underground’s 250). I am really proud to be working with them to help make it all work…it is a massive challenge! 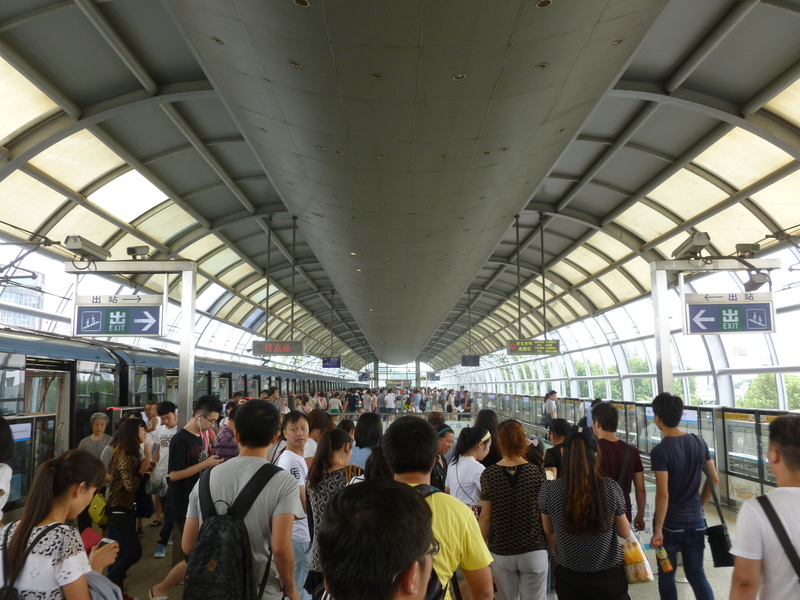 Here is one of the vertical access points to Line 1 at People’s Square, the Times Square of Shanghai – it is both the busiest station in terms of entries and exits but also a massive interchange between the two original and busiest lines (1 and 2). Do you see the woman with the light blue umbrella on the middle stair? Yes, that’s right – at one of the busiest places on earth she is blocking the flow by talking on her mobile phone (I watched her stand there for a good 3 minutes!). You thought the Petronas Towers were impressive? Well, I had to visit the Lujiazui area of Pudong again where Shanghai is growing skyscrapers like corn (or should I say rice?) to create what appears to be the world’s first cluster of supertall buildings! 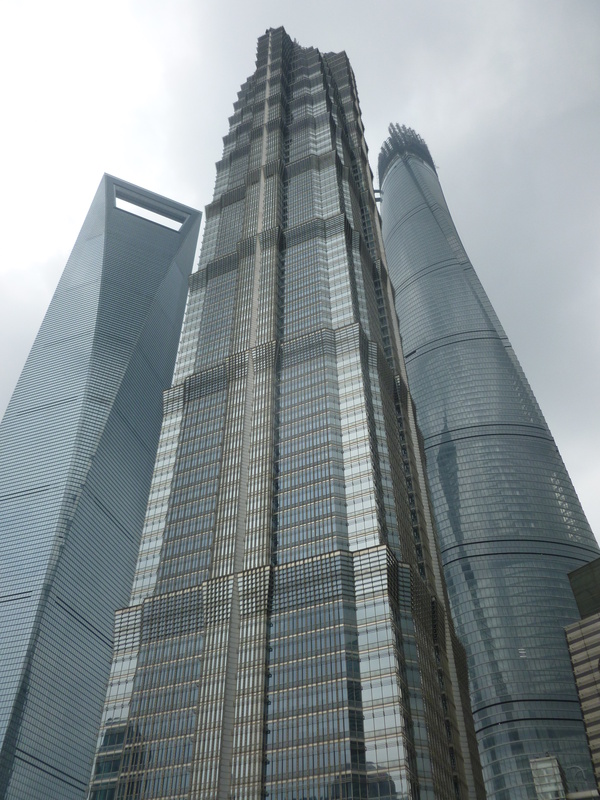 On the left is the Shanghai World Financial Center (known as the bottle opener because of its distinctive top) opened in 2008 as the 2nd tallest in the world (now 7th) – I went to the top in 2010. In the center is what actually might be my favorite, the Jin Mao Tower. It was the first in the area, finished in 1999, and was then in the top ten (but now is only 17th worldwide). The upper floors house the Grand Hyatt Hotel, which has a really cool interior atrium (as well as a semi-affordable Italian restaurant on the 56th floor with great views – a good lunch stop!). On the right is the nearly-completed Shanghai Tower, which at over 2,000 feet tall and 121 stories is now the 2nd tallest in the world (only the Burj Khalifa in Dubai is taller). It is distinguished by its twisting, two-layered facade. I look forward to visiting it and going to the top (in the world’s fastest and longest elevator traveling 40mph and about 1900 feet!) next time. At the end of the week I took a train from Shanghai to Nanjing, which is a little under 200 miles. The high-speed train took only about an hour and 20 minutes (even with a couple of intermediate stops). 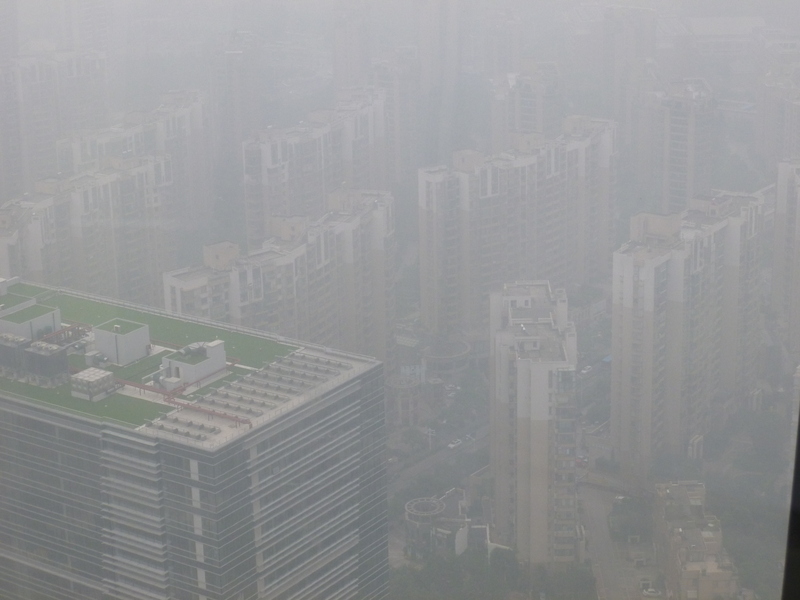 As my train proceeded northwest, the atmosphere got more and more desolate…away from the coast and the financial center of Shanghai are the factories, which produce the famously dreadful Chinese air quality. This was the view from my 53rd story hotel room at the new Fairmont Nanjing, which was preparing to host the 2014 Summer Youth Olympics right after I left. No, it wasn’t stormy…just the usual awful air quality and smog that makes it virtually impossible to see anything from above! I could actually see where the nearby metro line came above ground, but I didn’t realize that until my third day there because it was invisible! Despite the air quality, Nanjing (which means “Southern Capital” – Beijing is “Northern Capital”) was a nice city that I would like to have more time to visit. 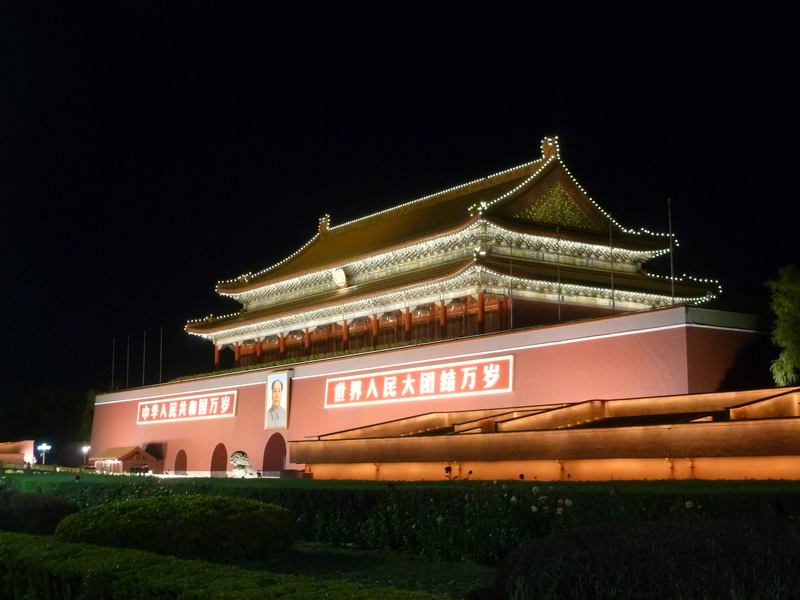 It’s conceptual place in Chinese history is kind of like Kyoto in Japan – an ancient capital that has a lot of culture. This is Line 1 of the metro at the north terminal, Maigaoqaio. The metro in Nanjing is designed a lot like Hong Kong, by which I mean to say a bit higher quality than some of the other cookie-cutter ones in China. It is also growing dramatically quickly – it doubled in size this past June when three new lines opened simultaneously. After three days in Nanjing I flew to Hong Kong for my final stop. This was my first flight on Dragonair, the shorter-distance subsidiary of Cathay Pacific. The flight was good, although the delay on the ground was longer than the entire 2:30 flying time! I understand that this is becoming more and more common as Chinese air space is often taken up by the military. It was very stormy in Hong Kong, but having selected a hotel adjacent to the Tsim Sha Tsui MTR station, I didn’t even have to go outside! After Nanjing I flew to Hong Kong for a couple of days of work there – the MTR there is absolutely one of the best designed and best run metros in the world. This is Kowloon Tong Station on the Kwun Tong (green) Line, where the line interchanges with the East Rail Line that goes to the border with the Mainland at Shenzhen. Here during rush hours they have one attendant per door to manage the massive passenger flows. At the end of August, after so many trips through Helsinki Airport, I finally got out and entered Finland! Astrid and I had a great long weekend there, enjoying the long hours of daylight, the relatively laid back atmosphere, and especially the island fortress of Suomenlinna. 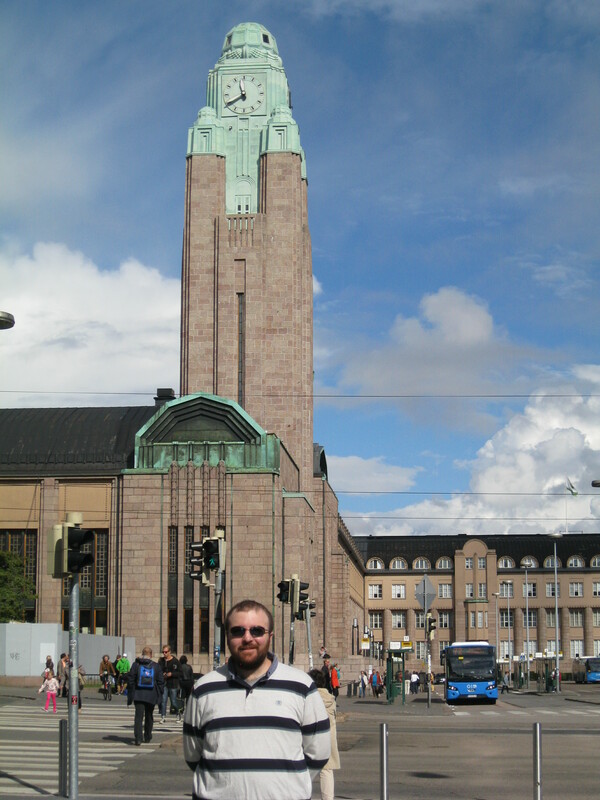 Here I am in front of Helsinki Central Station (known as “Helsinki C”), one of the most beautiful railway stations in the world (this one is from 1919). It was designed by Eliel Saarinen, who later moved to the US…his son Eero Saarinen became a very important American architect in the post-war period, including the Gateway Arch in St. Louis, the TWA terminal at JFK, and the main terminal at Dulles Airport. This is a scenic shot from the island fortress of Suomenlinna, probably our favorite spot in Helsinki. It is a UNESCO World Heritage Site, it was originally built by the Swedes starting in 1748 (called Sveaborg) to defend against the Russians, and they told us that it was considered to be the other great sea fortress of Europe after Gibraltar. It deserves its own post, for sure – but it was really pleasant with beautiful weather. 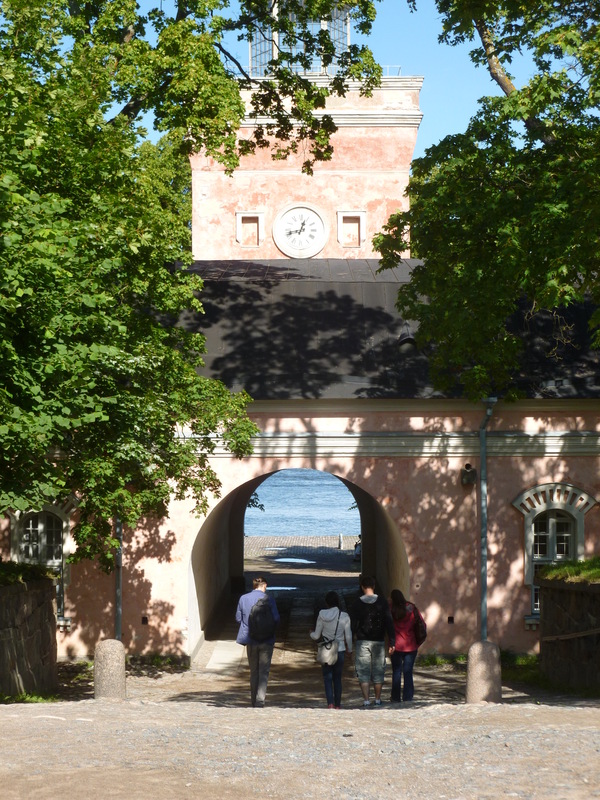 Here you can see the water through the archway where the ferry from Helsinki dropped us off. I started September in Vienna, on a quick one-day trip to that amazing city. It definitely requires a longer return with Astrid! From there I had to be in Barcelona a day later, so I took 22 hours to cross Europe by overnight sleeper train to Zurich and then on across Switzerland to Geneva and then into France and ultimately Spain by high-speed TGV train. 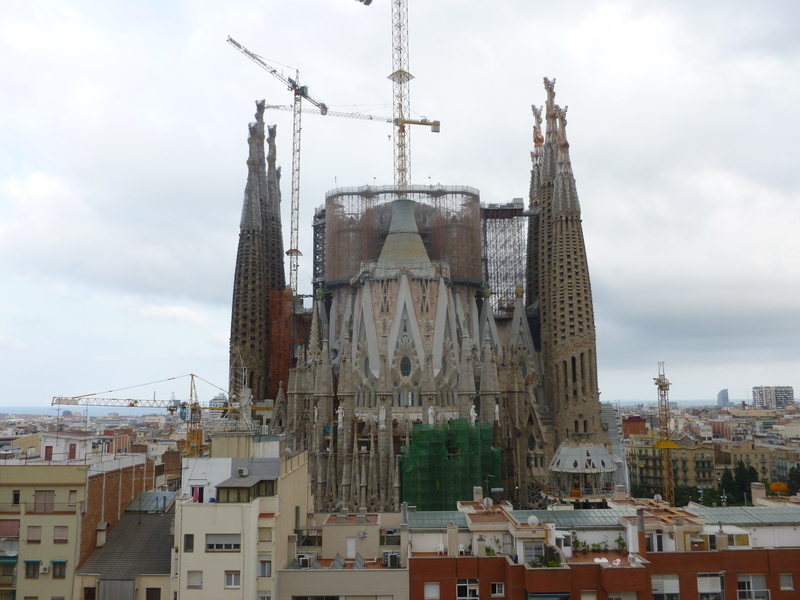 The view out of my hotel room of the Sagrada Famlia, the famous still-unfinished Gaudi church in Barcelona. After three trips already I have to go back in 2015 for work and Astrid is definitely coming along to visit this amazing city. After Barcelona, while Astrid went to Istanbul for a week’s vacation, I headed to Delhi in India – a new country! It was overwhelming – a week of hard work but also Delhi belly, extreme poverty, and amazing transformation as they build one of the world’s biggest modern metro systems. 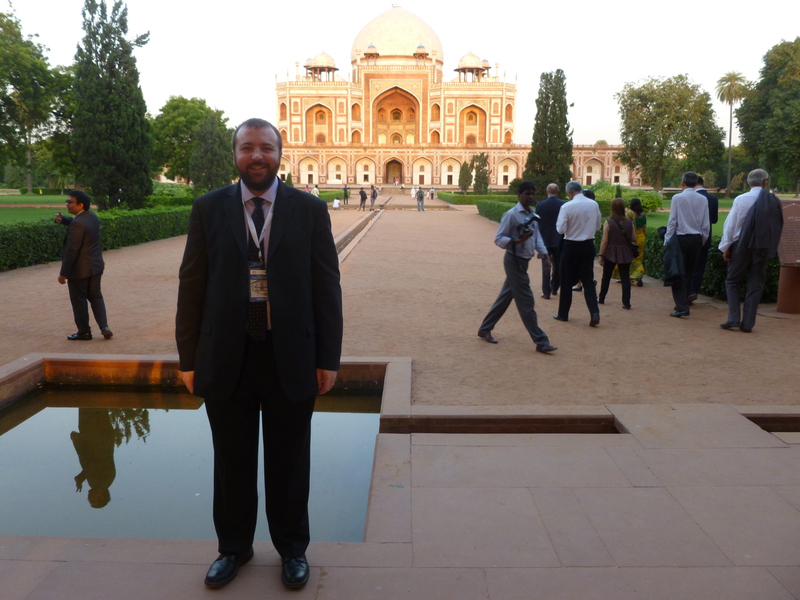 Here is a shot of me at a formal visit to Humayun’s Tomb, one of Delhi’s 3 UNESCO World Heritage Sites. 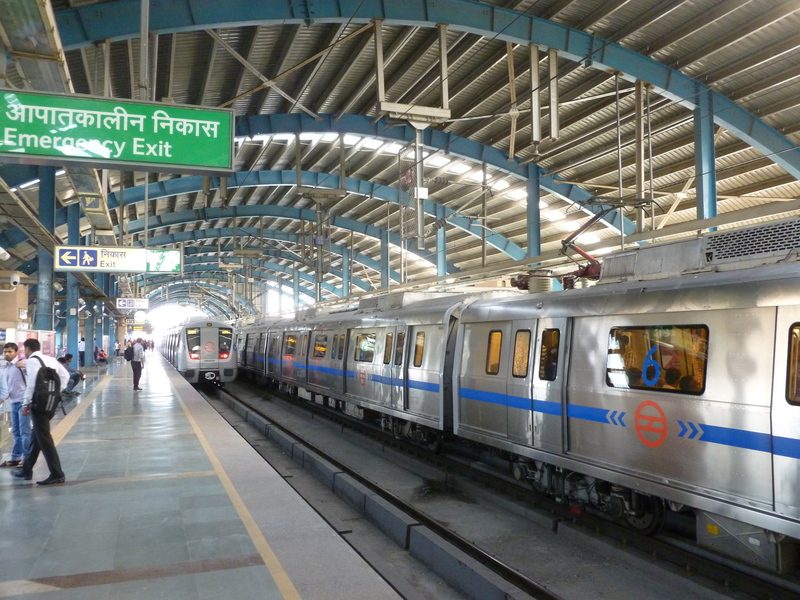 The metro system in Delhi is truly transforming the city, skipping from people on foot or animal to very fast and modern travel through the city. 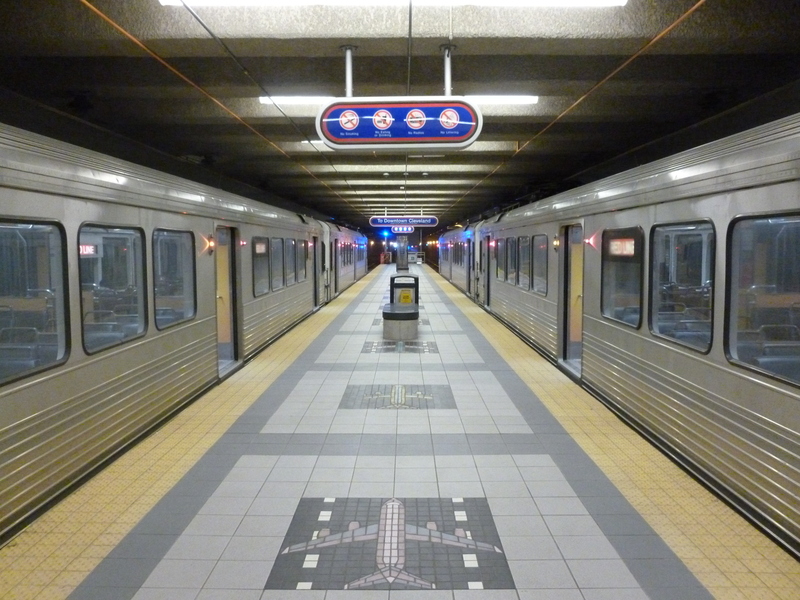 The system only started operating in 2002, and already trains have been extended from 4 cars to 6 cars (as shown here on the Blue Line) and to 8 cars on the very busy Yellow Line, which is the maximum length. I wonder if it should have therefore been designed for 10 or 12 cars then? A week after returning from Delhi – just enough time for my stomach to recover from a week straight of Indian food – it was time for Tex-Mex on another trip to Texas, this time primarily to Austin. 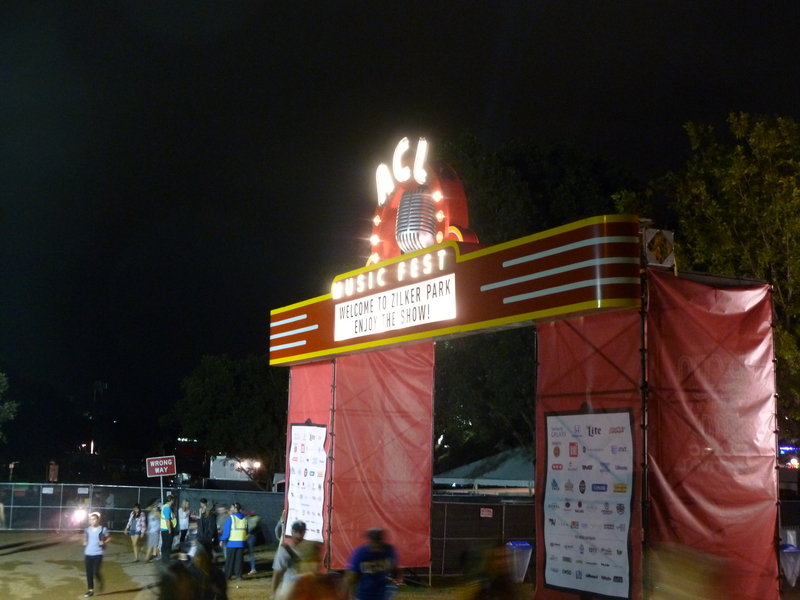 After the work we were fortunate enough to be given tickets to Austin City Limits as a gift!Now I am not a music nut like so many others, but it was cool to experience the famous festival. My colleague kept comparing it to the many European festivals he has attended and found it to be less rowdy and much cleaner! After Austin, we hopped on a Megabus to Houston for a quick overnight stop. Houston was the largest city in the US I’d never been to, and I have to say it was a bit more cosmopolitan than I was expecting. Early on my only day in Houston I dashed out to have a look at Houston’s MetroRail. 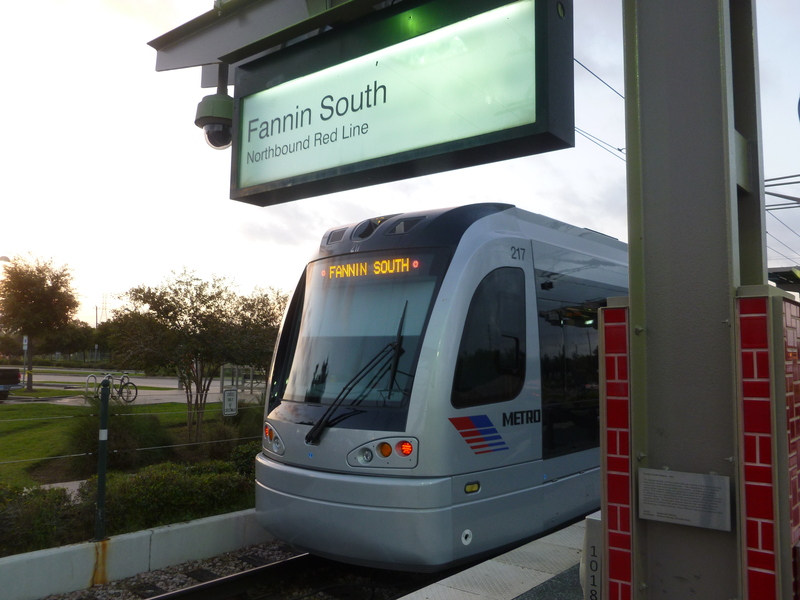 This is the southern terminal of the original (2004) line, now the Red Line – which is pretty dense serving the massive Texas Medical Center as well as downtown. Despite the car culture of oil capital Houston, the line has been a success. Once again, frequency is the name of the game – the core of the line operates every 6 minutes all day weekdays and every 12 minutes weekends (from 4am-8pm). By far the most important happening in October, however, was getting our permanent residency here in the UK! After a lot of paperwork and money – and a test – we made it…see our separate post about it. After a special birthday visit to the top of the Shard in London, I headed off on Finnair (via Helsinki once more) to the Far East, this time to Beijing. 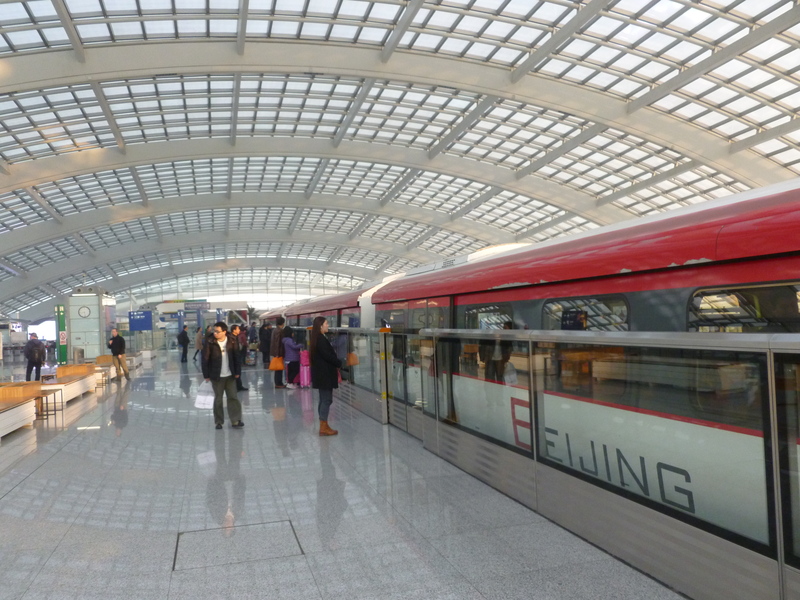 This is the impressive airport express train at Beijing Capital Airport’s international Terminal 3, the second largest terminal in the world (after Dubai’s Terminal 3). The airport as a whole is now the 2nd busiest in the world after Atlanta and growing fast and passing London Heathrow in 2010. 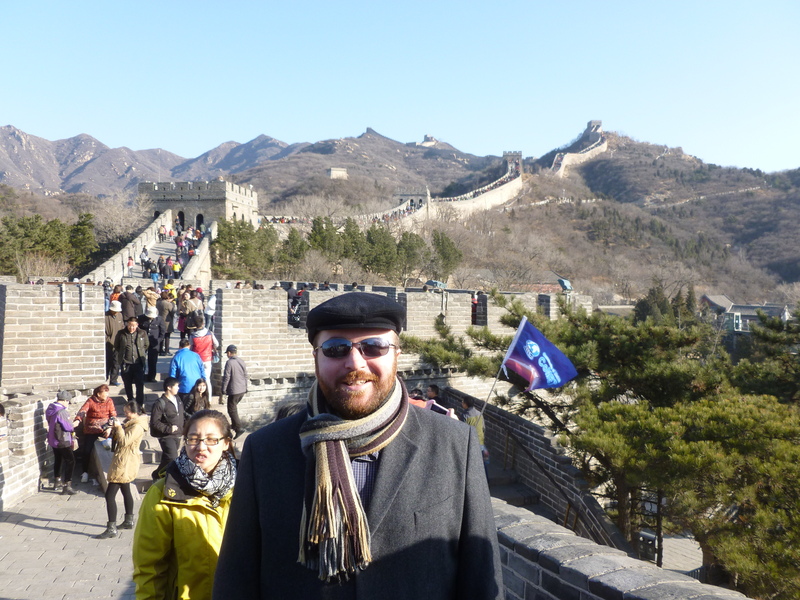 A pretty good wall, I’d say – we were fortunate that our gracious hosts took the group to the Badaling Great Wall, only about an hour west of Beijing. It was really cold though! I had to bundle up by borrowing a hat and buying some gloves. We tried for the second year in a row (and succeeded this time!) to visit the famous German Christmas Market in Birmingham – it is said to be the largest in the world not actually in Deutschland. 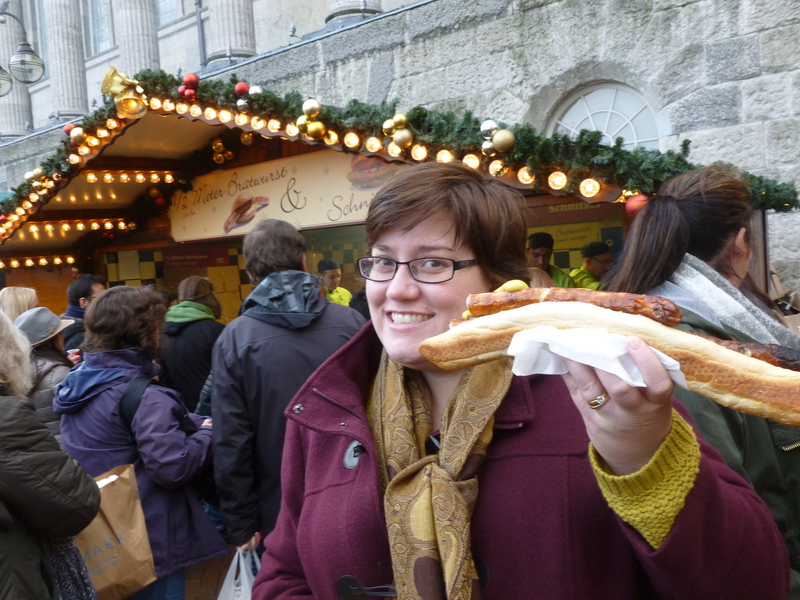 Astrid attempted to eat a bratwurst that was 1/2 meter long, while I chomped down on some schnitzel. Bratwurst and Schnitzel – what more could you want? 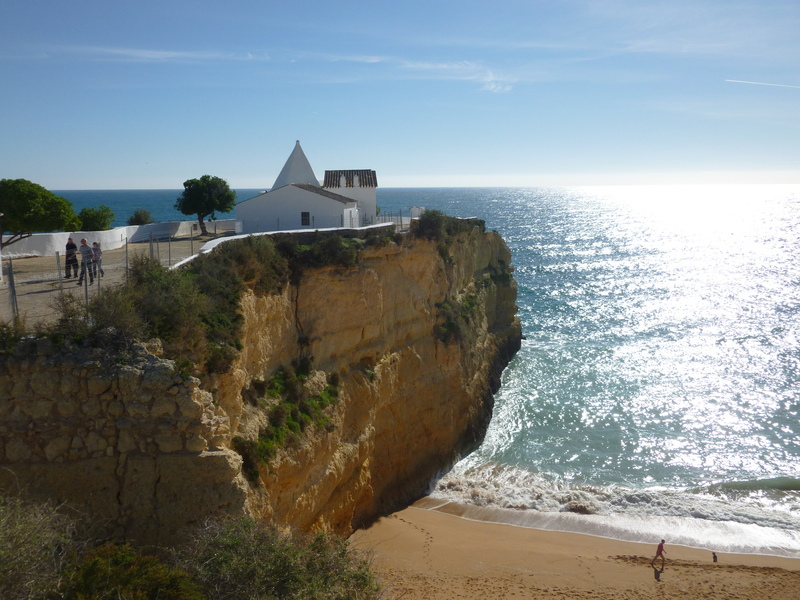 To wrap it up, our very relaxing Algarve holiday in Portugal that you’ve been reading about. Looks like paradise, doesn’t it? The beautiful blue sky, blue ocean, and shimmering sunshine of the Algarve. This is the Nossa Senhora da Rocha chapel in a picture-perfect setting. If you made it this far, thank you for reading my annual chronicle. I’m sorry that more of these didn’t come out over the course of the year. Best wishes to all for a happy and healthy 2015! 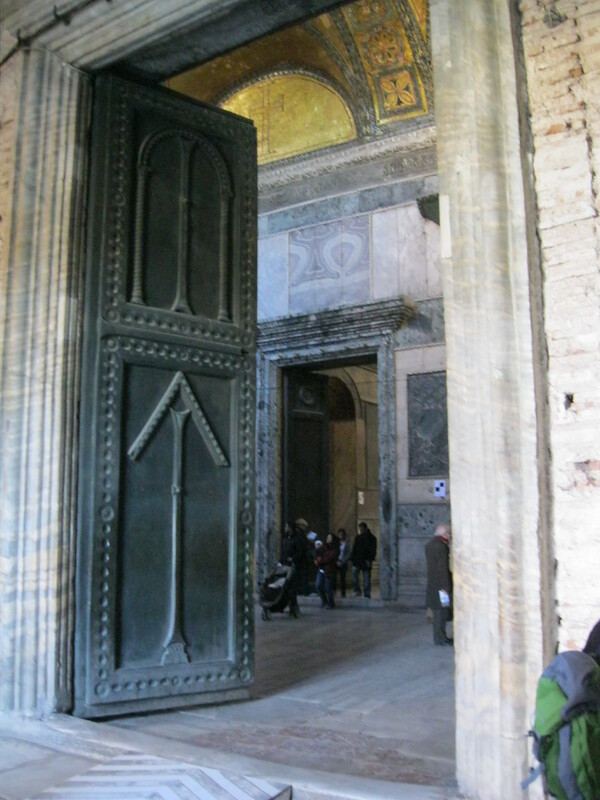 Some of the largest and most impressive doors I have ever seen. I like the arrows telling you which way to go. Those Byzantines had good way-finding! To give you a sense of scale…. Alex is just about 6 feet tall! 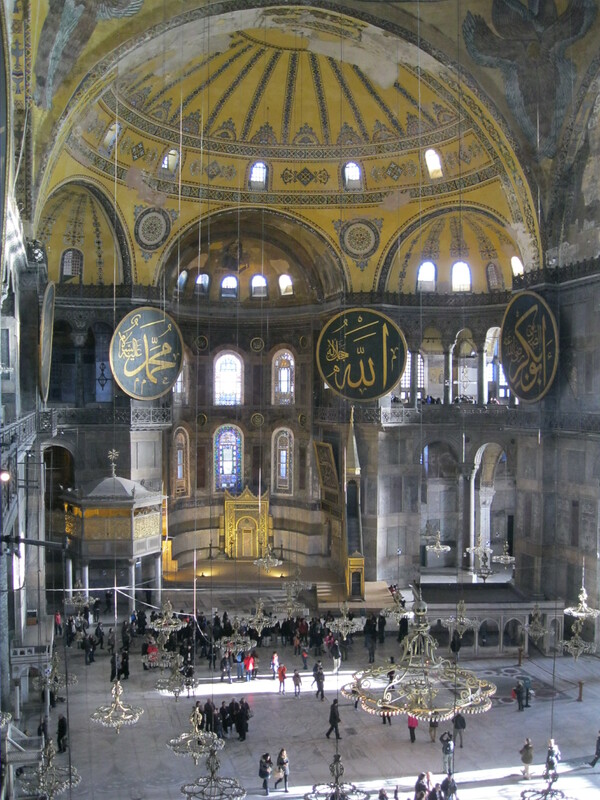 Notice how the marble in the center of the floor is worn down from centuries of foot traffic. Looking down into the main space. 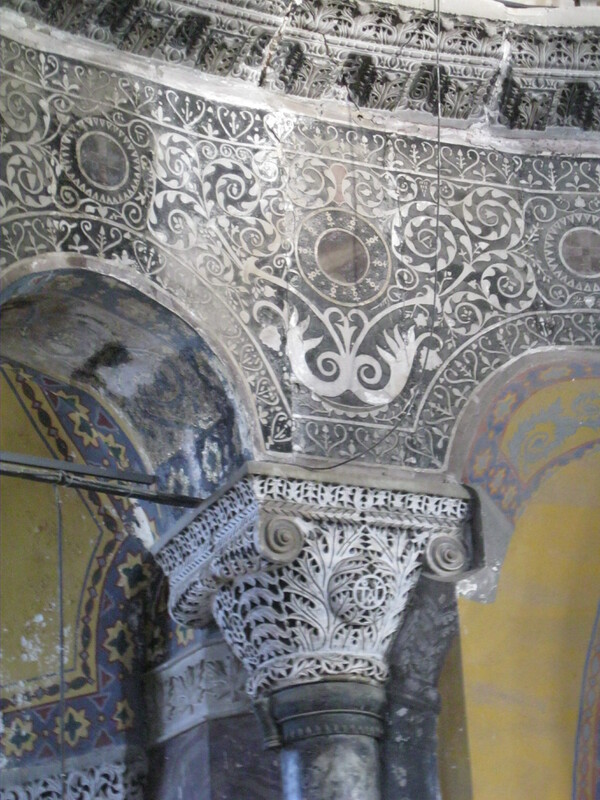 It’s fascinating because many of the Christian and Islamic remnants are still visible, coexisting side-by-side. I love the detailed stonework. It looks like lace, but it’s carved from rock. 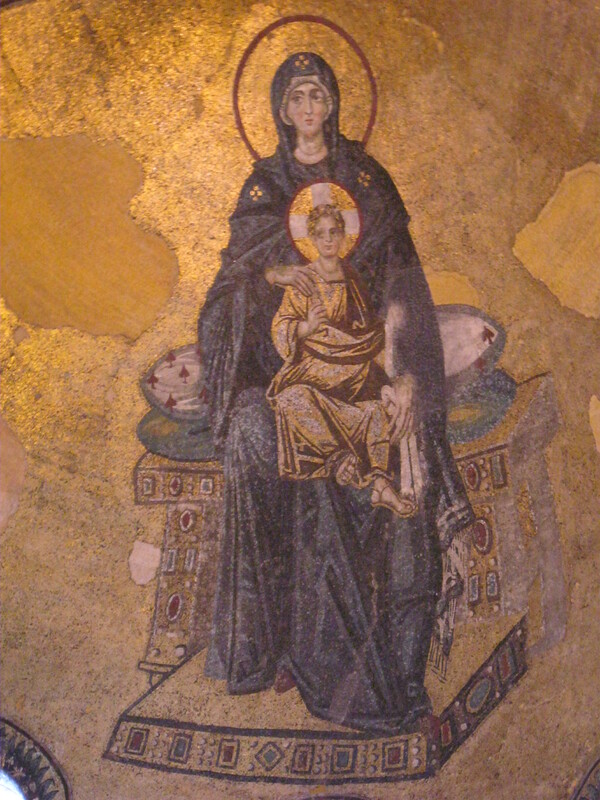 One of the most well-preserved Christian mosaics. They have these hanging chandeliers in the main space, which creates the odd effect of a false ceiling. It minimizes the vastness of the space, but offers much needed light during the winter days. 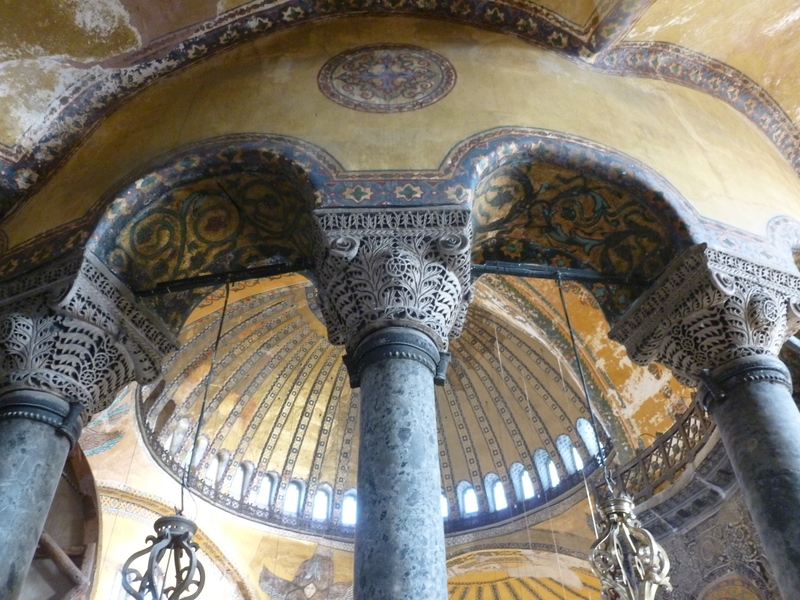 A view of the arches that support the large, interior dome. 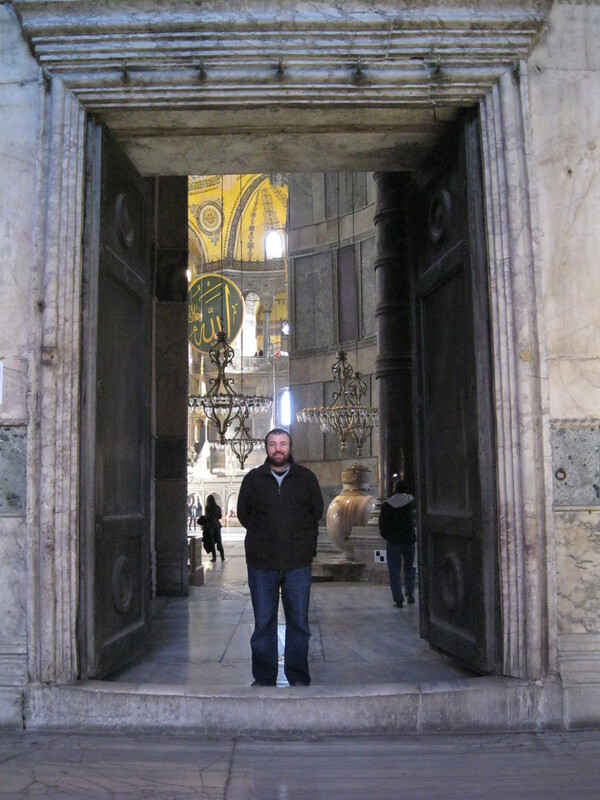 This must be one of the most popular spots to take a photograph in Istanbul – with the Aya Sofia in the background! 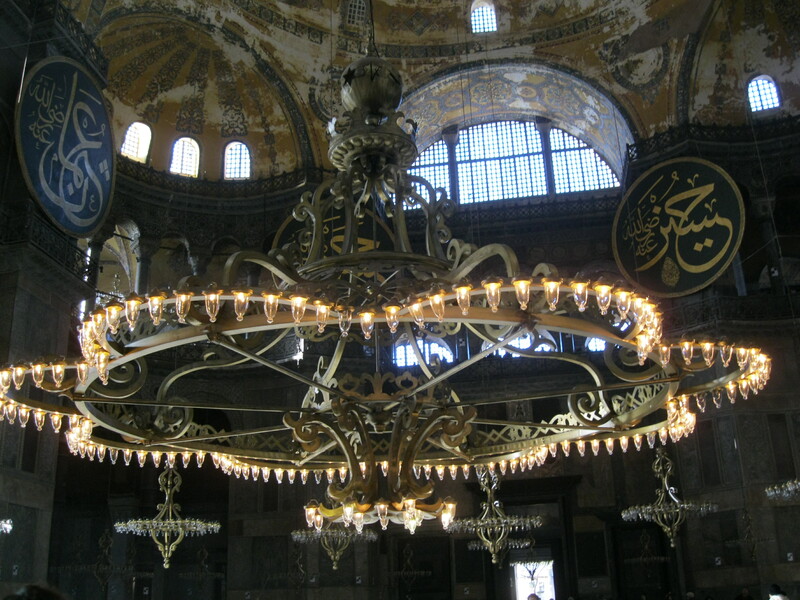 Luckily for me, Alex has a work trip to Istanbul next fall, so I’ll definitely be going back again! There were too many of these signs for comfort along the Southern Ridges walk in Singapore! 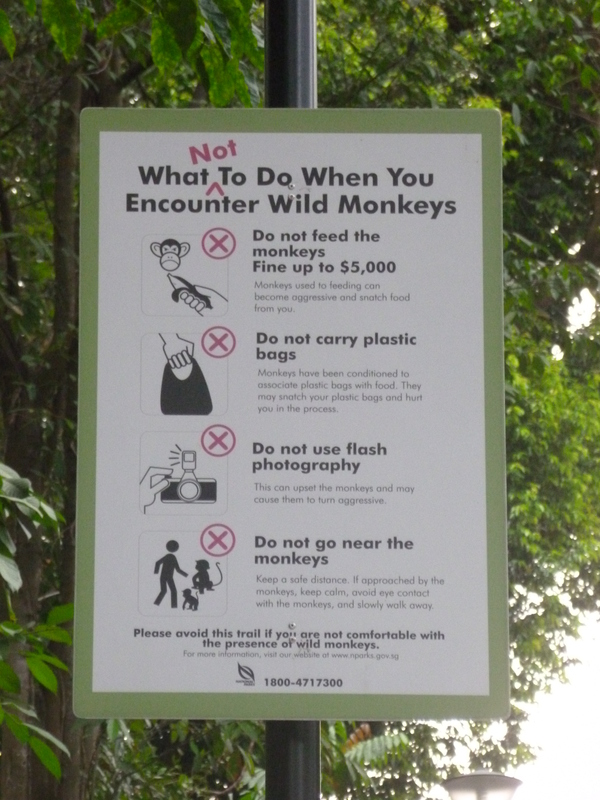 When I saw this sign the first time, I asked myself – am I comfortable with the presence of wild monkeys? Then I figured that, hey, it’s Singapore – if the monkeys are only half as well behaved as the people there will be no problem! I’m just finishing a 12-day trip to Kuala Lumpur and Singapore, having left home last Monday night and getting home Friday night. I’m glad to say that I really love both cities, especially the people and the food. The heat, however, is another matter entirely; when I was going to bed the first night in Singapore at about 1am local time the Internet said that the temperature was 88F and it felt like 101F – always crazy hot and humid 365 days a year! 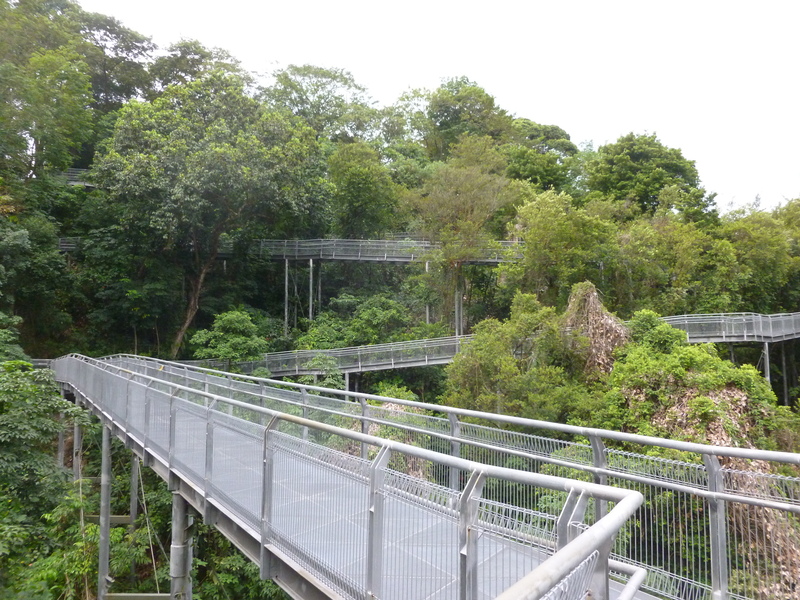 On my last morning in Singapore, when the working was done, I decided to try the Southern Ridges walk. I had read about this on my first trip there a year ago but didn’t have time. So, I got up very early, skipped the shower, and headed out. Now, you might be thinking that nature and me don’t go together, and you’d be right; but I was attracted by the chance to travel out of the city center to a different part of the city-state (use different metro stations! 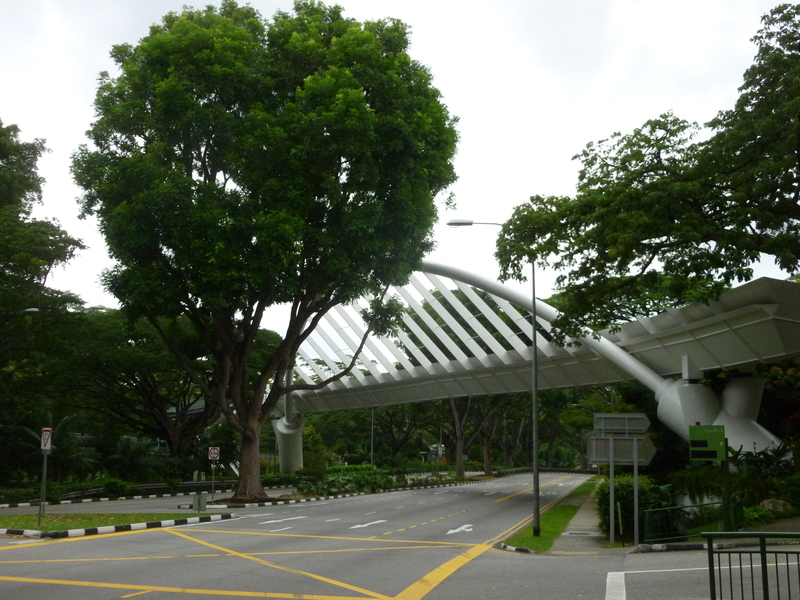 ), for a chance at some views, and for some of the architecture there in terms of bridges. I figured that if I went early enough I could at least deal with temperatures in the 80s instead of 90s, reduce my sun exposure, and even make it back for the hotel breakfast! And, dare I say, even I was yearning for a little physical activity and time outdoors after more than a week where there is virtually no walking and everything is sealed indoors due to the heat. My chosen access point was the Alexandra Arch. The curved deck and titled arch are like an opened leaf (thanks, Wikipedia – I didn’t get that on my own!). 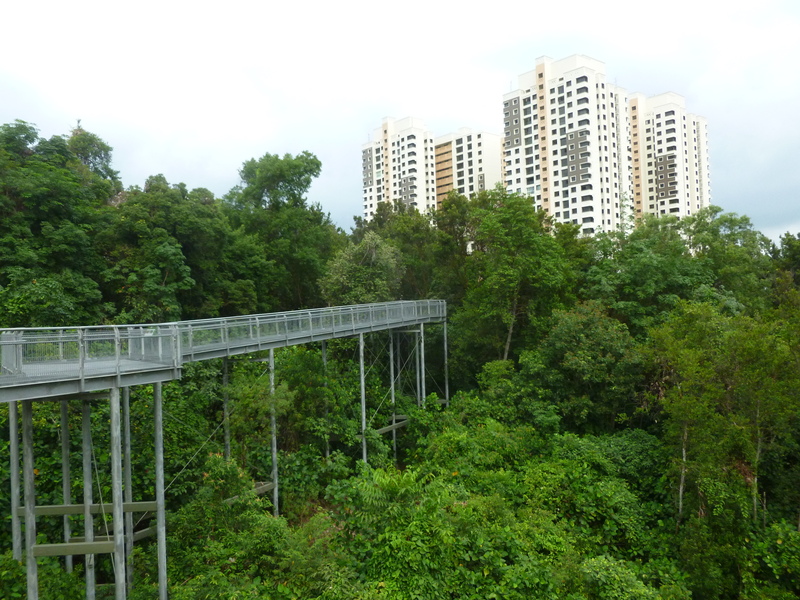 So, after a quick trip on the MRT to HarbourFront and a connecting bus the last 10 minutes or so and uphill, I had reached the trail. The elevation and the threat of serious rain produced a nice breeze. 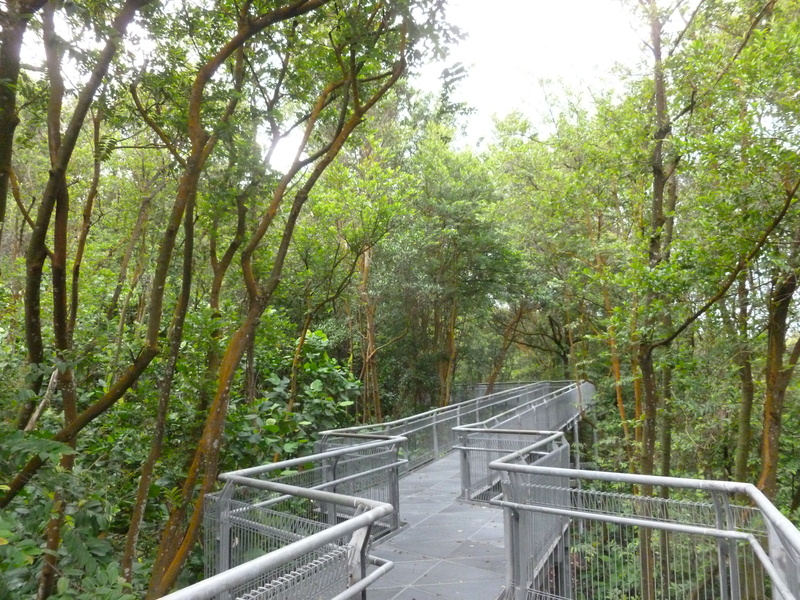 After crossing the bridge I immediately entered the Forest Walk, a 0.8-mile path through the woods. Right away, the city and its people disappear – a really nice feature in such a dense place! The walk soars over the ground, apparently as much as 60 feet up in places. Unfortunately there were some hills to climb too! 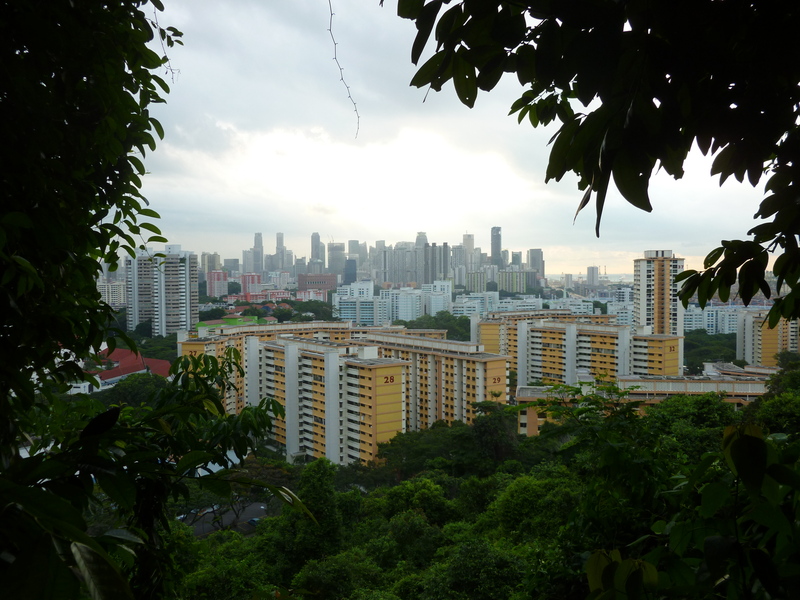 Then abruptly the forest ends, leaving you in Telok Blangah Hill Park and a short “Hilltop Walk” connects to the next point of interest. 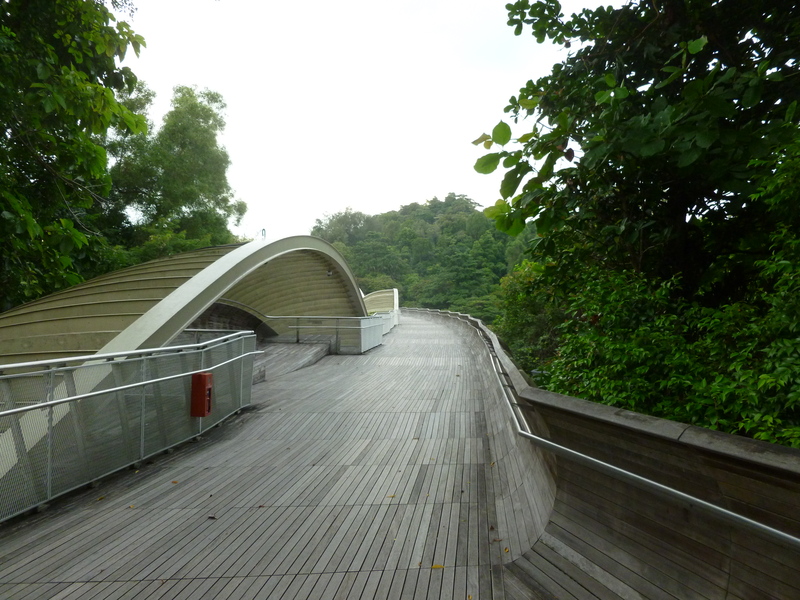 This is the Henderson Waves, another high-design pedestrian bridge. It is 118 feet above the road, and the undulating wave form would probably be better appreciated from under than on the bridge. It gets lit with LEDs at night which would be cool to see. Visible from the bridge is the waterfront ‘Reflections at Keppel Bay’, which I learned is a luxury residential complex designed by Daniel Libeskind. Astrid and I have been seeing Libeskind works scattered around the world, and have developed a general distaste for his work – but this is probably the first high-rise work I’ve seen and I have to say that I kind of liked it, at least from a distance (he was involved in the ex-Freedom Tower, but I think the design was modified by others). Looking back through the canopy of trees the other way was a nice view of the city core. 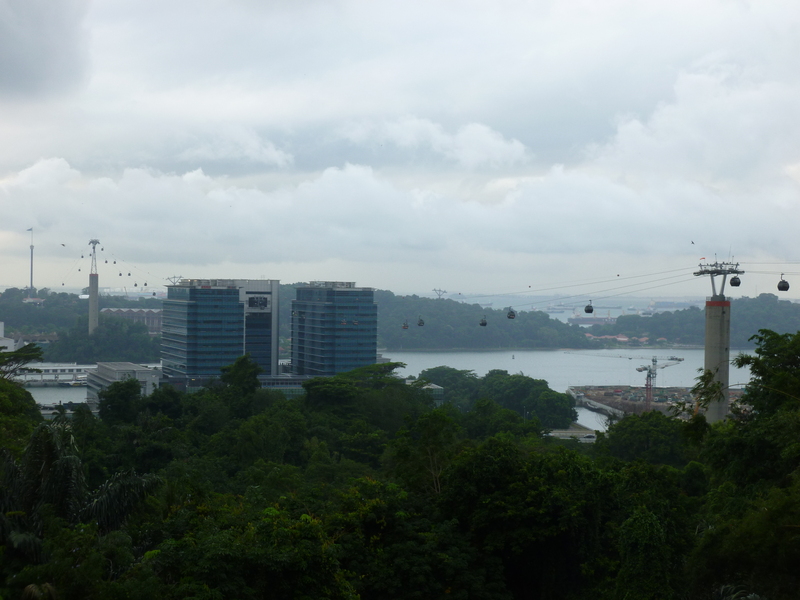 The last section of the walk is in Mount Tabor Park, which is more accessible and more popular – including through this cable car that goes through the building in the middle by HarbourFront and then continues over to Sentosa Island, which is a big beach resort. You can really see the moody sky out over the water beyond – I was ready to be drenched but instead only got a few small drops. 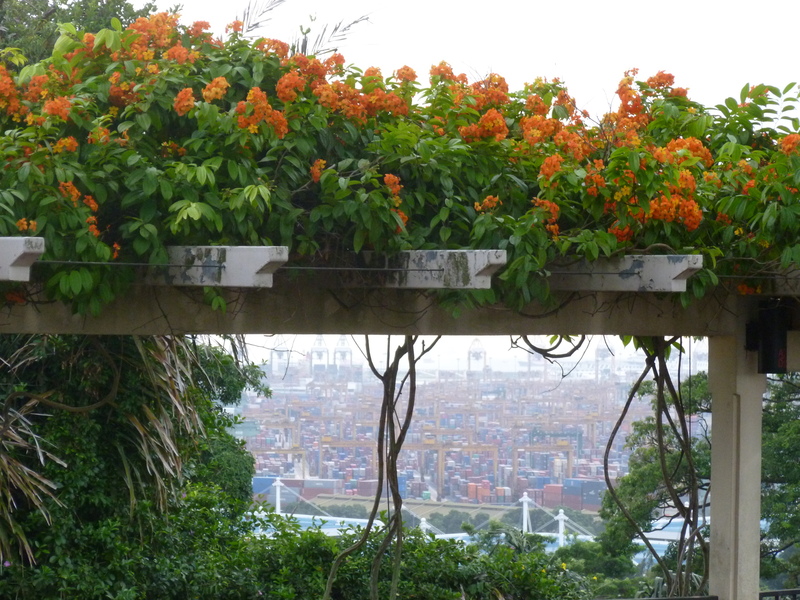 There were some lovely bright orange flowers on a trellis all along the walk through the park (don’t ask me what kind – but I can still appreciate them! ), and I thought it was neat to see that framing a view of the massive industrial port operation down below that has been so critical to Singapore’s history. So, after a very nice and nearly solitary walk, I hiked down massive staircases to HarbourFront and dashed back to my hotel on the MRT during rush hour. Singapore is one of the most densely populated places on earth, in a sense – it is the third-most dense country or territory (after Macau and Monaco, just ahead of Hong Kong), but as a city it doesn’t even make the top 50 (but neither do any other modern fully developed world cities). 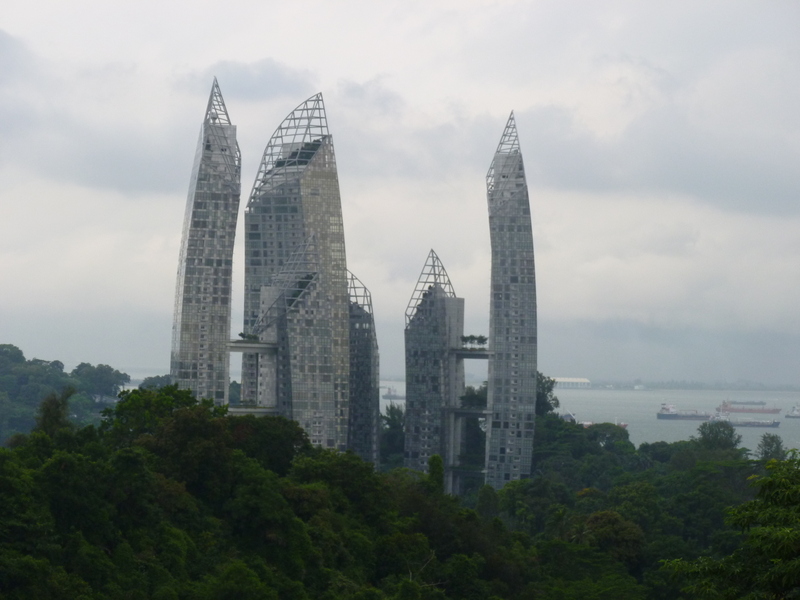 The Singapore model, though, involves lots of towers with residences and lots of green space, which helps to temper at least a bit the incredibly hot and humid climate. I really like Singapore, but I will be glad to return to my chosen climate in the UK!